I will give a presentation on "Making Sense of 9/11 and the War on Terror" at the Face of Truth conference in Orlando on Saturday, March 3. My lecture is scheduled to begin at 4 p.m. The focus of my presentation will be on the need to grow the 9/11 truth movement. We need to be able to convince our fellow citizens to embrace 9/11 truth with simple and irrefutable facts about 9/11 and the War on Terror. 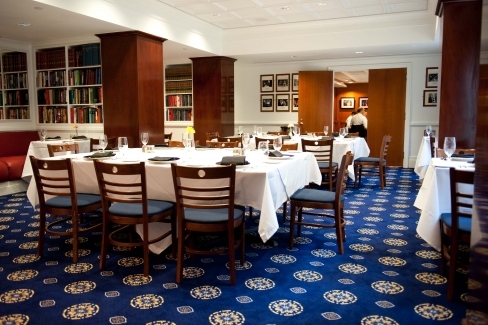 THE WINNERS' ROOM at the National Press Club was the venue for the overflow crowd that attended Bollyn's presentation, "The Dual Deception of 9/11 and the War on Terror" in Washington, D.C.
Another view of the Winners' Room. 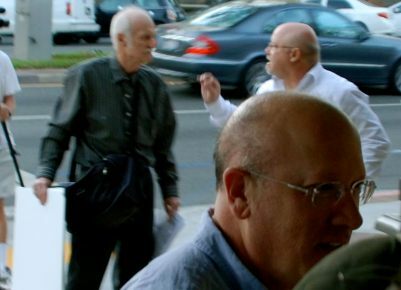 The event was bumped up to the National Press Club after the planned venue, Busboys and Poets, received threats from Zionists who use gangster tactics to stifle discussion of Israel's role in the false-flag terrorism of 9/11. Americans need to stand up to Zionist assaults against our freedoms of speech and assembly. 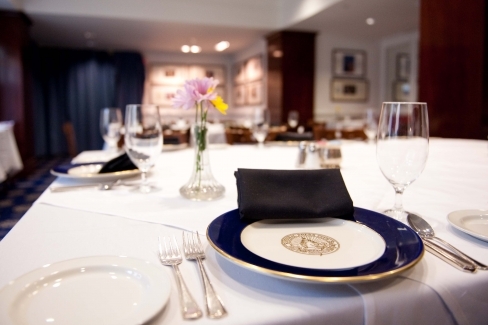 Washington, D.C. - Last night's presentation, a dinner event at the National Press Club, was an outstanding success. 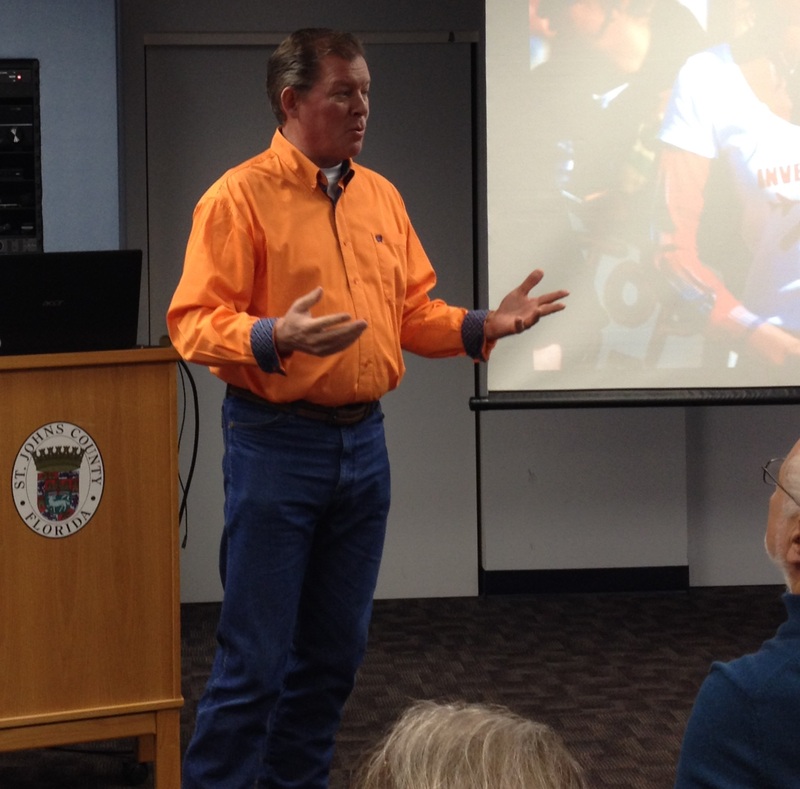 My presentation was given to an overflow crowd of about 50 people in the Winners' Room and the adjacent room. The event was arranged by DC911Truth.org with the help of the Sarah McClendon group. I spoke at the NPC last in November 2000 after the publication of my article about electronic voter fraud in U.S. elections, "The Death of Democracy or May the Best Hacker Win." 9/7 - Brooklyn, New York - Wednesday, September 7 at 7-9 p.m. 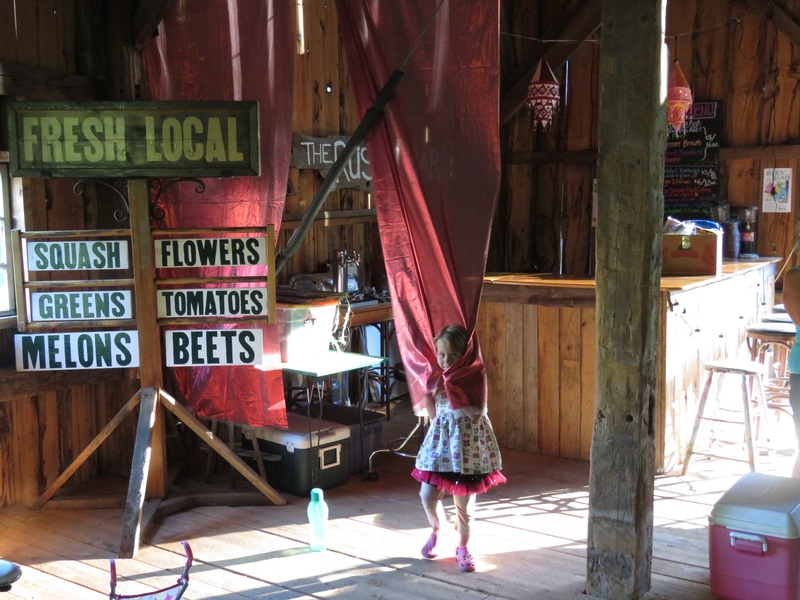 The Brooklyn Commons, 388 Atlantic Ave.
9/8 - Hartford, Connecticut - Thursday, Sept. 8, 6-9:30 p.m. NOTE - This venue cancelled due to threats against the church. An alternative venue is being sought. 9/9 - New York, N.Y. - Friday, Sept. 9, 7-9 p.m.
9/11 Austin, Texas - Sunday, Sept. 11, 12-4 p.m.
Scholz's Biergarten, 1607 San Jacinto Blvd. The word crisis comes from the Greek word for decision: krisis, which is why the word means the decisive point of a catastrophe or emergency when a difficult decision must be made. Crisis also means the turning point of a disease when an important change takes place, indicating either recovery or death. The political crisis that Americans are facing is not simply the presidential election of 2016, but the fact that our nation is at a turning point where an important decision must be made concerning the fate of our American republic. As citizens, we must demand that the candidates address the critical decision to end the fraudulent military campaign known as the global “War on Terror”. 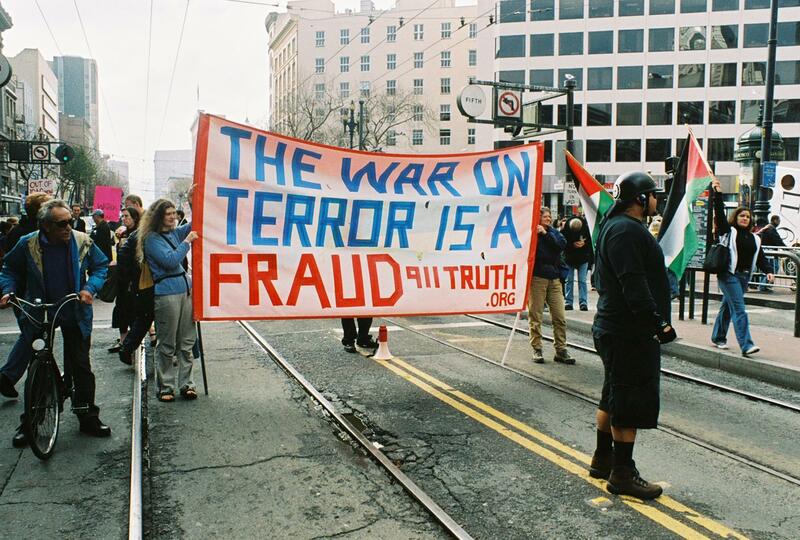 The “War on Terror” is an Israeli/Zionist fraud that was foisted on the American people in the immediate aftermath of the terror attacks of 9/11. Unbeknownst to most Americans at the time, however, is the fact that the terror attacks of 9/11 were an Israeli false-flag operation that was designed to be blamed on Arab Muslims for the sake of kick-starting the long-planned Zionist stratagem known as the “War on Terror,” which is really an Israeli war agenda to be fought by the U.S.
As long as the United States continues to wage the extremely costly and counter-productive “War on Terror” the American people will simply be unable to enjoy the true blessings of peace and prosperity. According to the National Priorities Project, the current military campaign in Afghanistan is costing us more than four million dollars per hour and the total cost of the wars fought since 2001 is more than eight million dollars per hour for a total of nearly 1.7 trillion dollars. These military campaigns are literally taking the food off of our table. The United States has been at war against Iraq for twenty-five years - since 1991. We have been waging war in Afghanistan for almost fifteen years (not counting U.S. involvement in the Afghan-Soviet War). Isn't it time to raise our voices so that the political establishment and mainstream media wake up to the fact that we want this multi-trillion dollar fraud called the War on Terror to end? It should be abundantly clear that neither the selected politicians nor the media will do anything to end this outrageous fraud unless we make our voices heard. 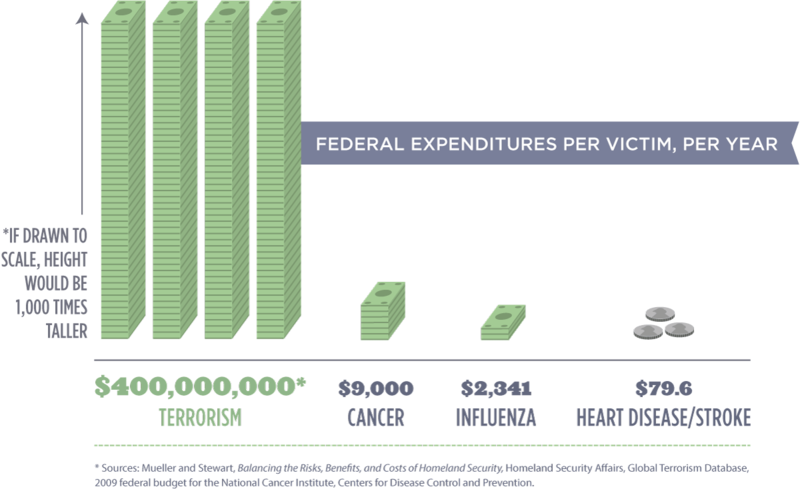 This graphic illustrates the criminal nature of the War on Terror, which consumes $400 million per victim of terrorism per year. The U.S. has spent nearly $1.7 trillion (all borrowed money) fighting wars since 2001. When do we say enough? The “War on Terror” is now in its 15th year having been initiated by President George W. Bush in 2001 and continued by Barack Obama since 2009. The next president will have to decide to either continue this extremely costly and disastrous war policy or to pull back from the “War on Terror” and stop waging criminal wars in places that have nothing to do with our national interest. If we want an end to the nation-destroying madness known as the “War on Terror”, we the people must make our voices heard by the candidates and the media at this critical point in our nation’s history. The nation we save may very well be our own. which began in New England in June. Book a suitable meeting room in a public library or some other neutral free-speech venue. The room needs to seat at least 50 people and have a computer compatible projector, screen, and sound system. Public library rooms are usually free although they may charge a nominal fee. Once the date and location are set, then together we will promote the event using social media, local 9/11 truth groups and anti-war organizations, and flyers. Together, we can make a change. Let's do it! Support Christopher Bollyn's efforts to spread awareness of the deception of our time. 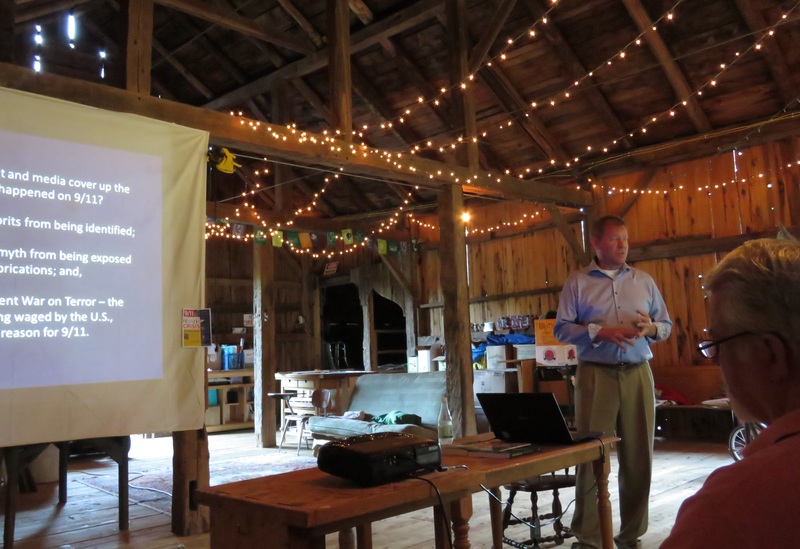 Christopher Bollyn's speaking event in Greenfield, Massachusetts, ran into organized resistance that resulted in the event being moved from three different venues in town. 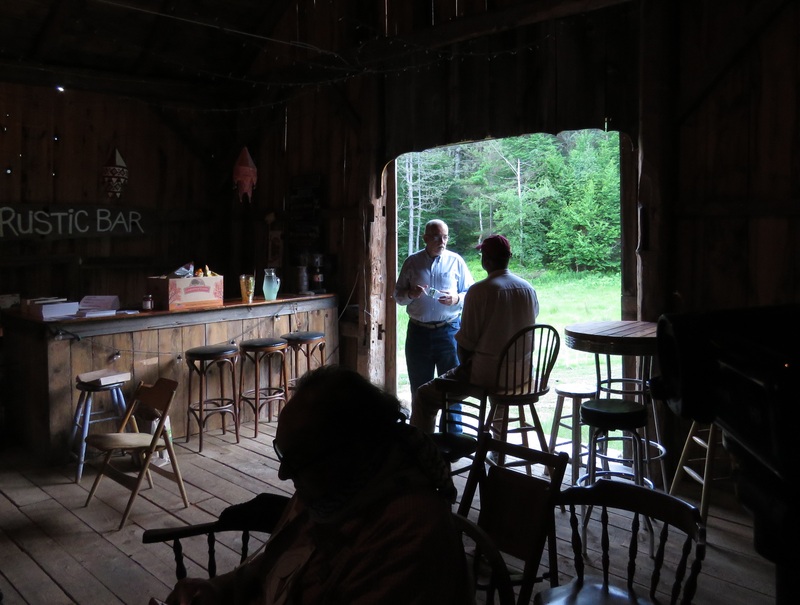 Finally, after being pulled from three locations due to threats and other demands, we moved the event to a rustic barn in an idyllic setting, just west of Greenfield, in Charlemont. The new location could not have been nicer or more beautiful. as the venue was prepared. and played with Ajax and his ball. I was glad that the midsummer event was being held in such a beautiful green setting. The presentation went very well without any constraints or friction. 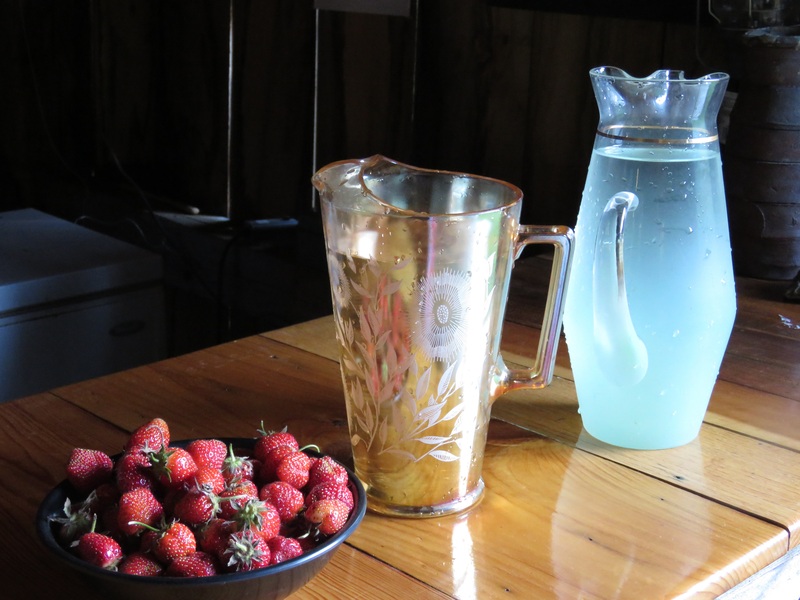 What would a midsummer event be without fresh strawberries? 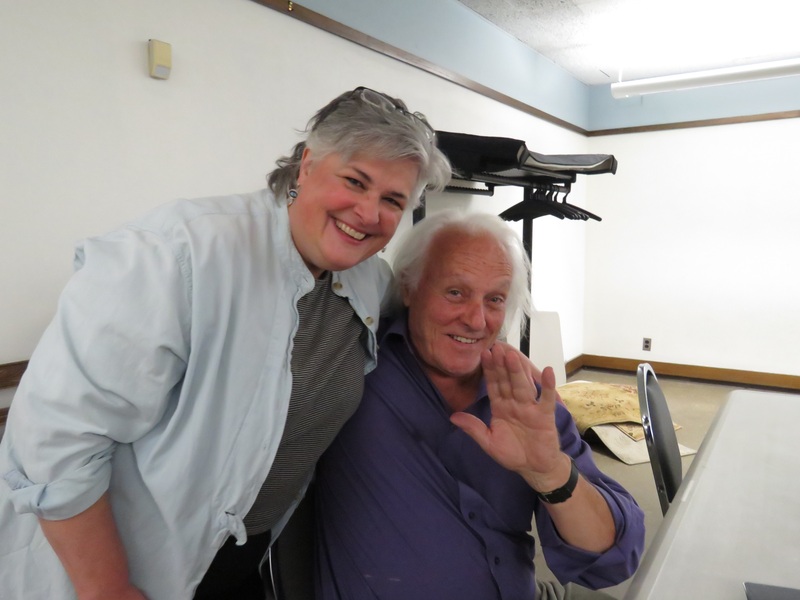 Deb Chandler, here with Dennis Morrisseau at the event in Brattleboro, Vermont, persevered and prevailed, in spite of all of the obstacles thrown in her path by the 9/11 truth gate-keepers of Greenfield. 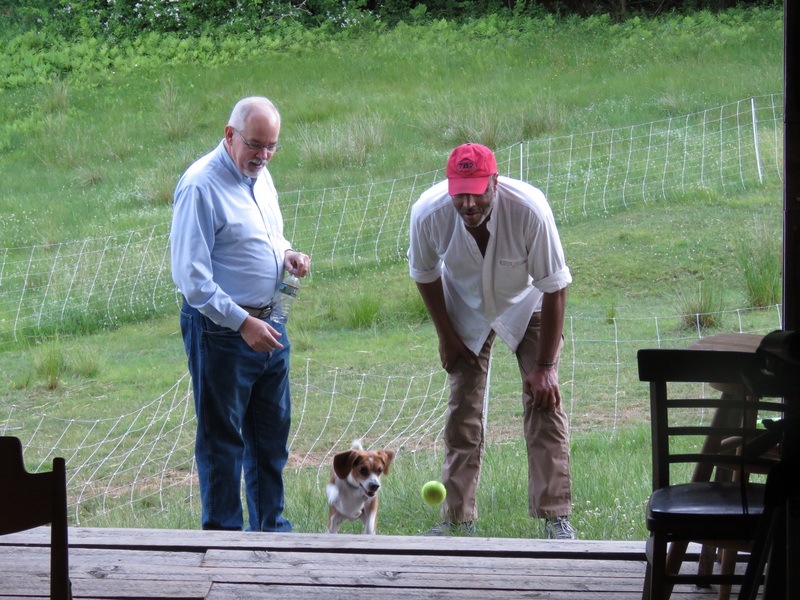 Christopher Bollyn and Dennis Morrisseau in Brattleboro, Vermont. Roger Waters of Pink Floyd is one of the few big-name musicians who has the moral courage to take a stand against the brutal Israeli occupation of Palestine. 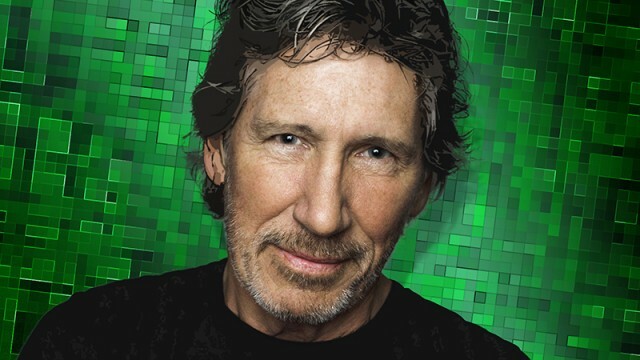 I have often said that the 9/11 truth movement needs support from well-known people in the arts, and Roger Waters of Pink Floyd is the name that comes to mind first, because he is a well established star that has shown a high degree of moral courage on the issue of the Israeli occupation of Palestine. Since he understands the criminal and brutal nature of the Israeli occupation, Waters is well positioned to grasp the Israeli role in the false-flag terrorism of 9/11. When one comprehends the essence of the problem, it is easy to understand the whole problem when provided with the necessary information. 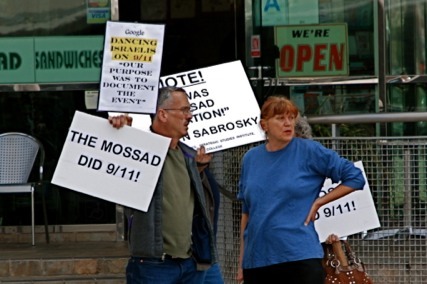 The dual deception of the 9/11 cover-up and the fraudulent War on Terror is a product of the extreme right-wing Likud terrorist faction headed by Benjamin Netanyahu. 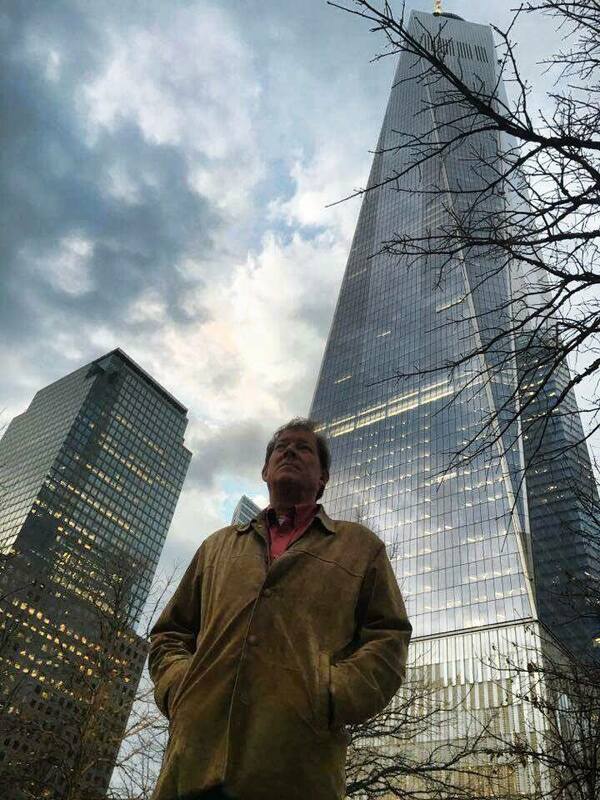 Link to the website for the movie "The Occupation of the American Mind"
I am planning another Solving 9-11 tour across America this winter to present my research and engage in discussion with the public. If you would like your town to be added to the tour, let me know. All that is needed is a person who is willing to arrange a venue and do some promotion for the event. A speaking tour like this is, however, a big undertaking and requires raising funds. To do a project like this, I do have to appeal to my readers and the public to help fund it. With your help, we can make it happen. Together, we can increase awareness of 9-11 truth across America. Meridian, Idaho - Friday, March 4. 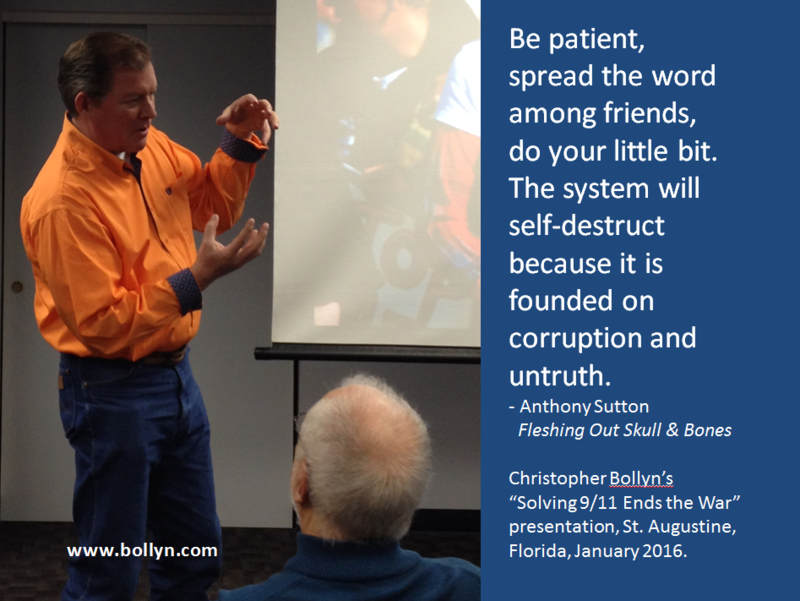 Christopher Bollyn is planning a winter tour in the United States to present his Solving 9-11 research to the public. Hosting a Solving 9-11 event is not difficult but it does require a local person to make the necessary arrangements. The first thing is to find a suitable place to have the event. Public libraries are ideal for such book events, and are usually free. 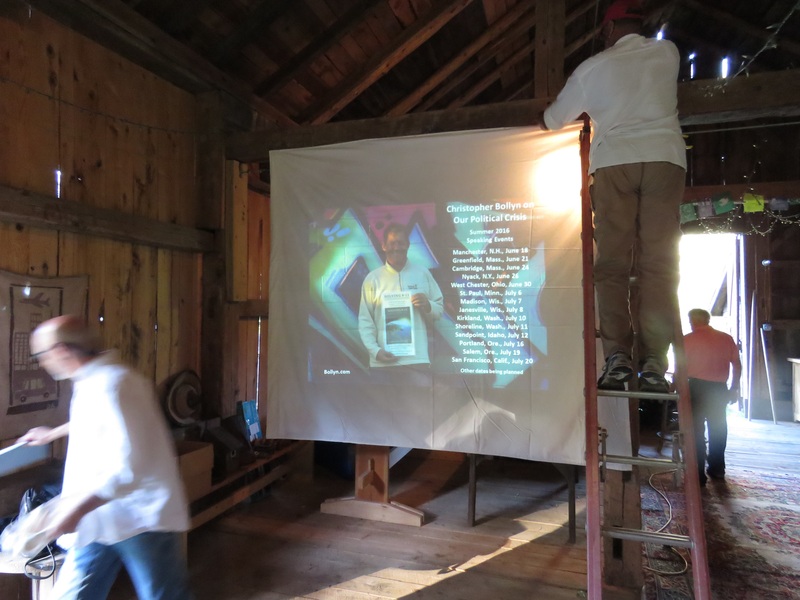 All that is required is a sound and projection system to present the Power Point slides - and seating for the expected crowd. Don't worry about bringing in hundreds of people. Most of my events are for groups of 30-50 people. If a video is made of an event it will reach many more people after the fact. The following video, for example, is of a presentation I gave last winter for a group of about 40 in a small restaurant in Dallas, Texas. Today, the video that was put together by my local host has reached over 100,000 viewers on YouTube; that's more than 2,500 times the number of people who attended the event. This is what concerned citizens can do! We are changing things. The truth will prevail. 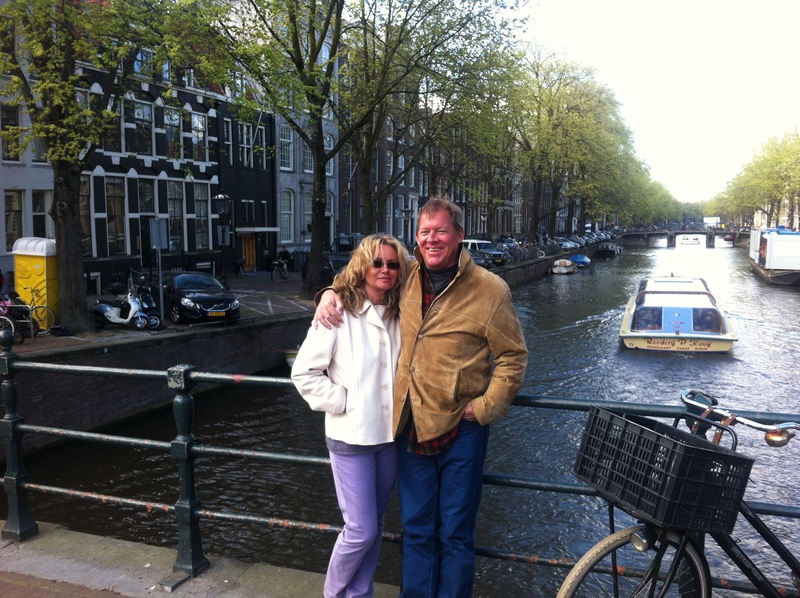 Richard Gage's successful visit to Holland on April 16-17 was the first in a series of 9-11 Truth events to hit Holland this spring. 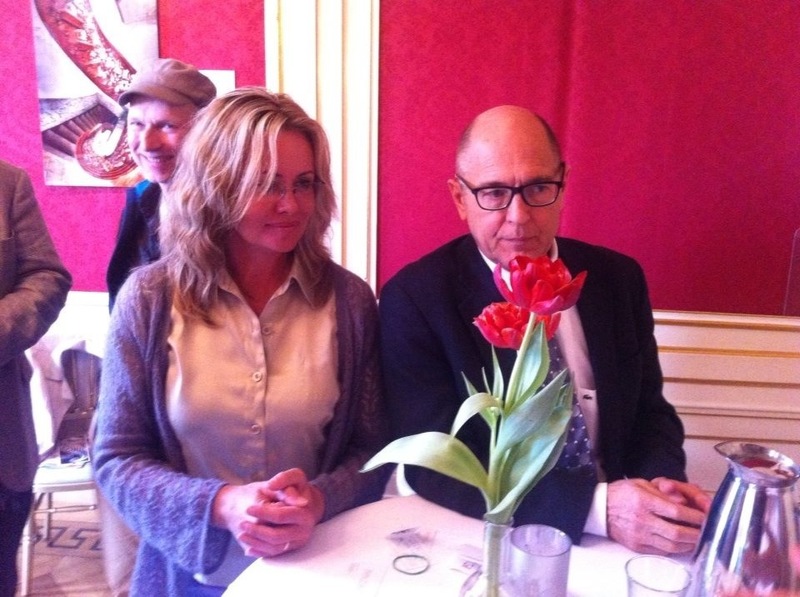 Richard Gage, founder of Architects and Engineers for 9/11 Truth, speaking at a press conference in the Museum Het Grachtenhuis in Amsterdam on April 17, the day after a very well-received presentation at the Technical University of Delft. SHAKING HANDS - The students of TU Delft turned out in force and showed great interest in Richard Gage's presentation. The Aula Auditorium was filled to near capacity after the event had nearly been cancelled due to pressure put on the university. 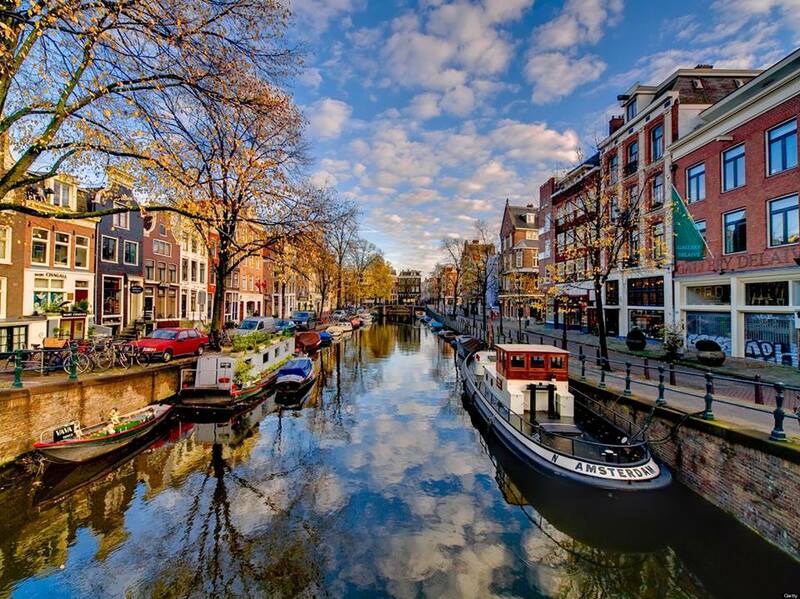 A phone call from one of Holland's leading engineers convinced the administration of the importance of going ahead with the event. 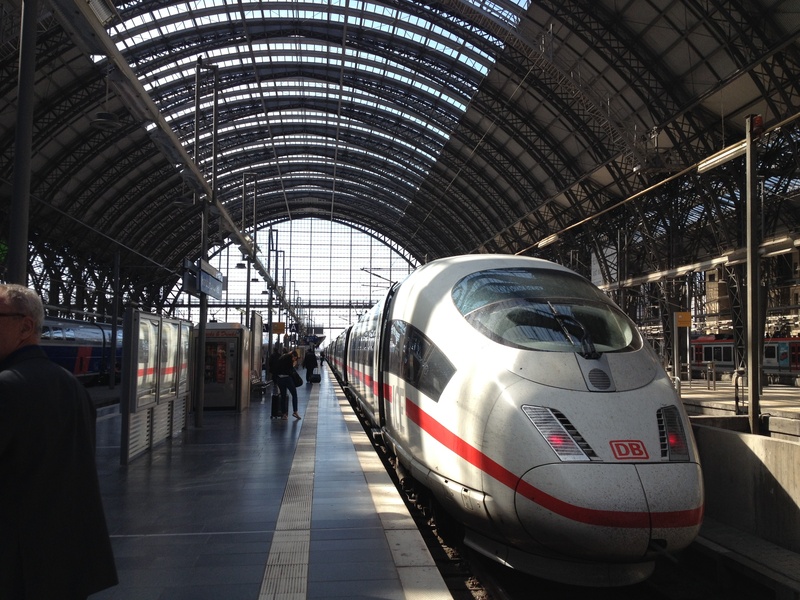 The Bollyns traveled to Holland on the German high-speed ICE trains to see Richard Gage. The ride on the ICE trains is smooth and comfortable at 150 mph (240 km/h). 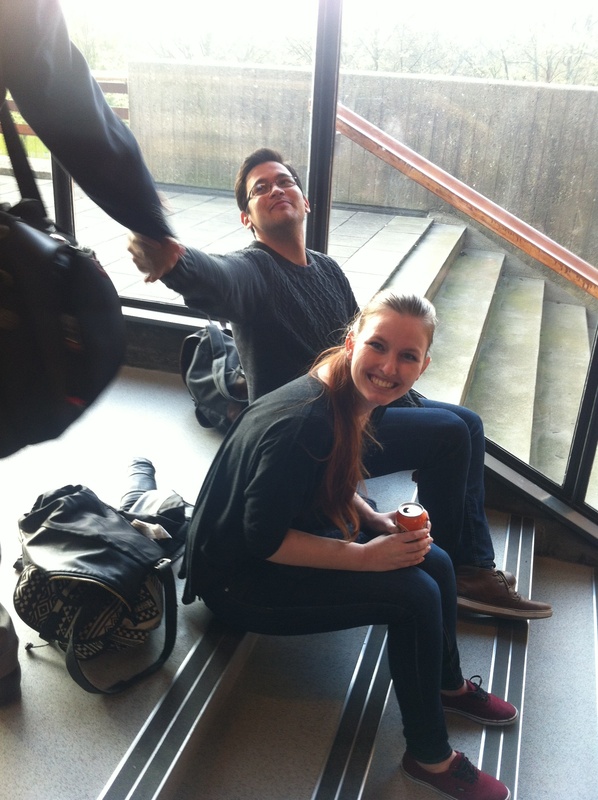 Christopher and Helje enjoying their visit to Amsterdam - and the hospitality of the Dutch. 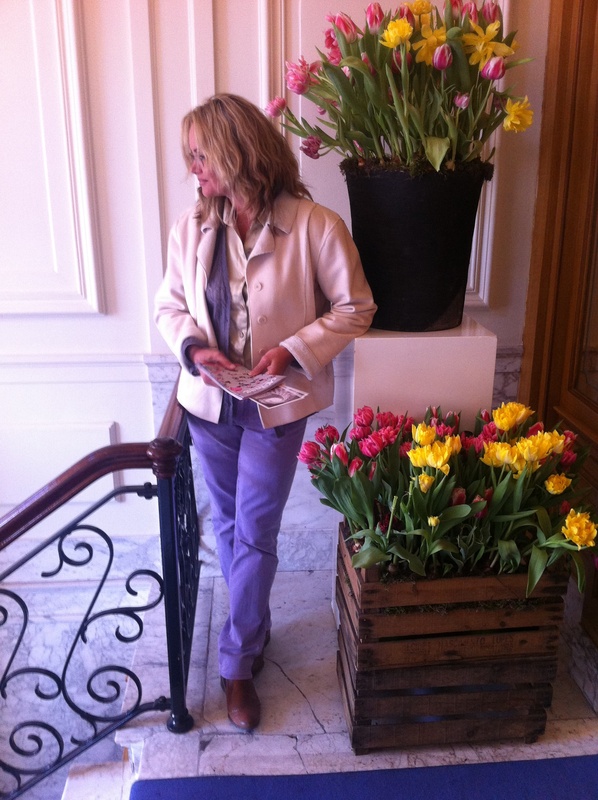 Helje waiting for Richard Gage at the press conference on April 17. 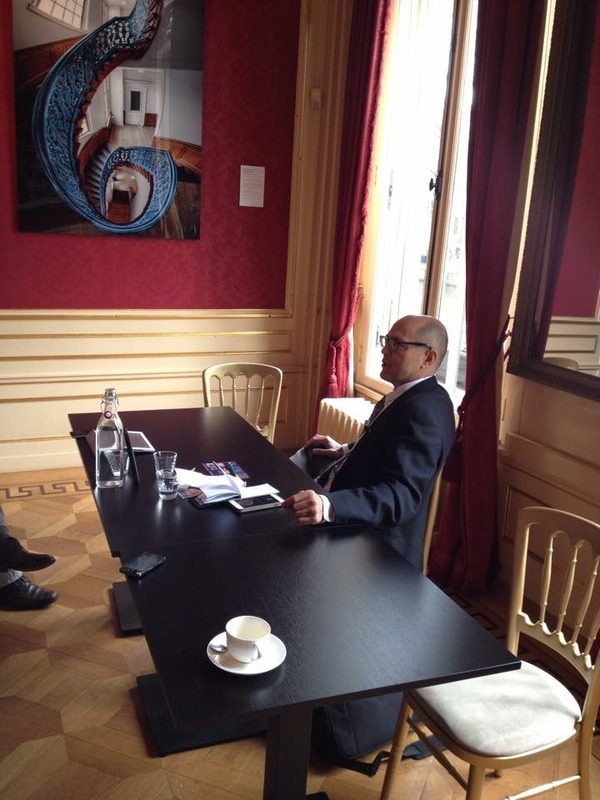 Richard Gage speaking with journalists at Het Grachtenhuis in Amsterdam. 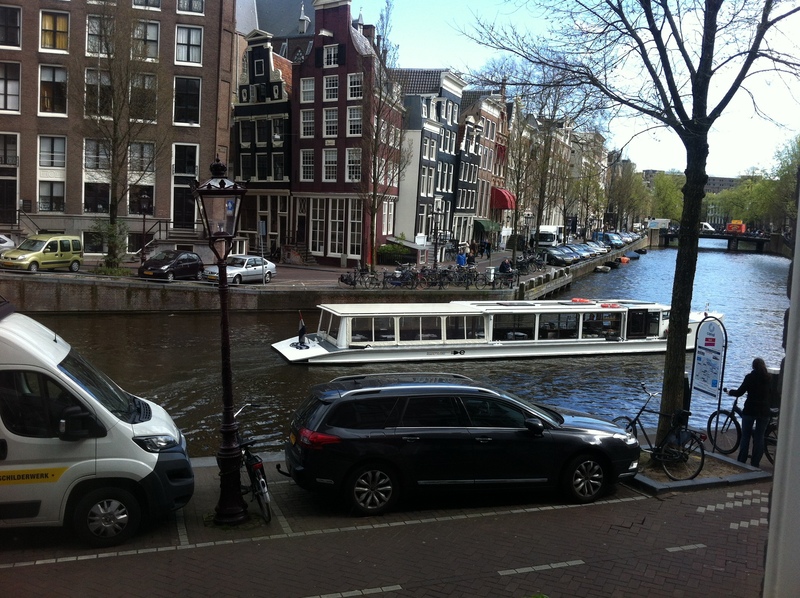 The view from the window of Het Grachtenhuis. 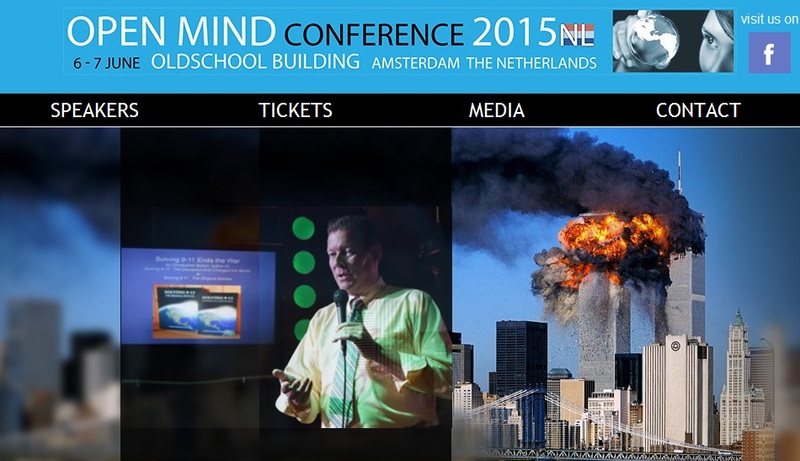 The speakers at the Open Mind Conference 2015 NL will discuss a range of issues of the utmost importance that are not discussed in the mainstream media - such as 9-11 Truth. 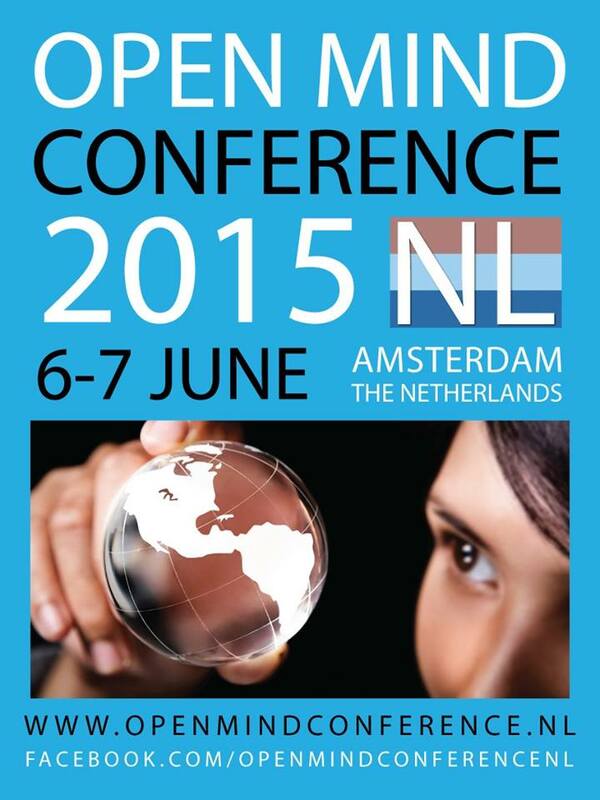 SEE YOU IN AMSTERDAM - Christopher Bollyn will speak at the Open Mind Conference in Amsterdam on June 6. See you there! Great possibilities are ours for the making. You can support the Solving 9-11 Tour by buying books for your friends and relatives - or the local library. If you can't make it to any of these events you can support the tour by buying a copy of Solving 9-11 for a friend or relative - or your local library. Copies of Solving 9-11: The Deception that Changed the World are available (U.S. orders) for a $20 donation. Solving 9-11: The Original Articles, which contains my 9-11 research articles in chronological order, is available for $25. 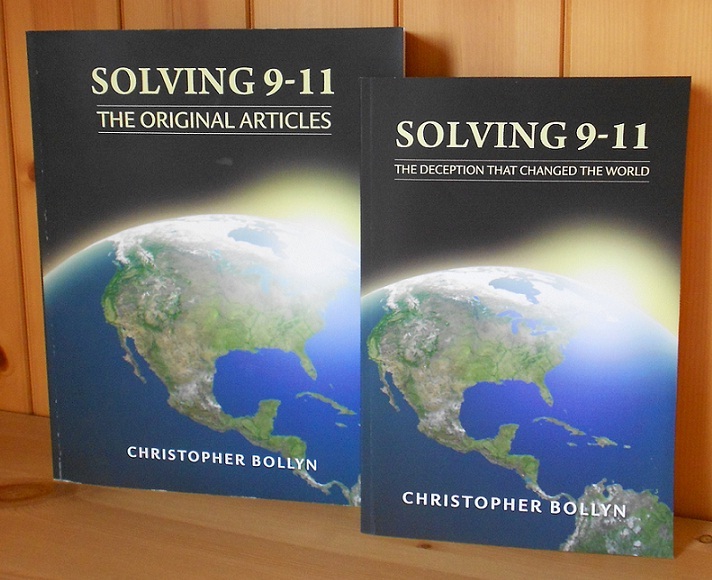 If you would like to support the Solving 9-11 tour or get copies of the books, donate via PayPal to Bollyn at Bollynbooks dot com or via theDonate button on Bollyn.com. I begin to feel like I was in the last generation of Americans who took a civics class. I begin to feel like most Americans don't understand the First Amendment, don't understand the idea of freedom of speech, and don't understand that it's the responsibility of the citizen to speak out. 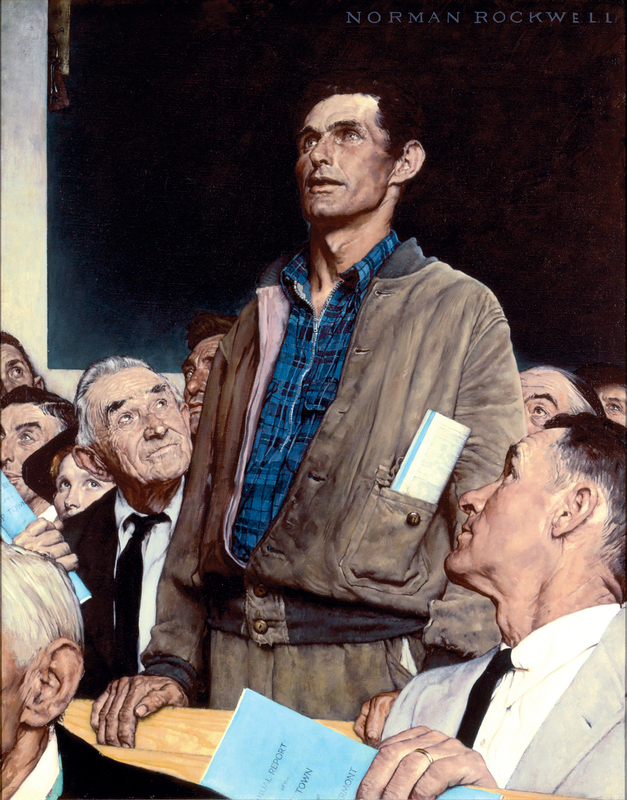 The "freedom of speech" and "the right of the people peaceably to assemble" are basic American freedoms guaranteed in the first article of The Bill of Rights of The Constitution of the United States. In a truly democratic republic, the participation of the citizen is required. As the late Roger Ebert said, "it's the responsibility of the citizen to speak out." It is, indeed, our responsibility to speak out about the deception of the false-flag terror attacks of 9-11 because to accept the lies about what happened on September 11, 2001, is to acquiesce in our enslavement and the destruction of our democratic republic. What could be more important than that? This is where I need your help. 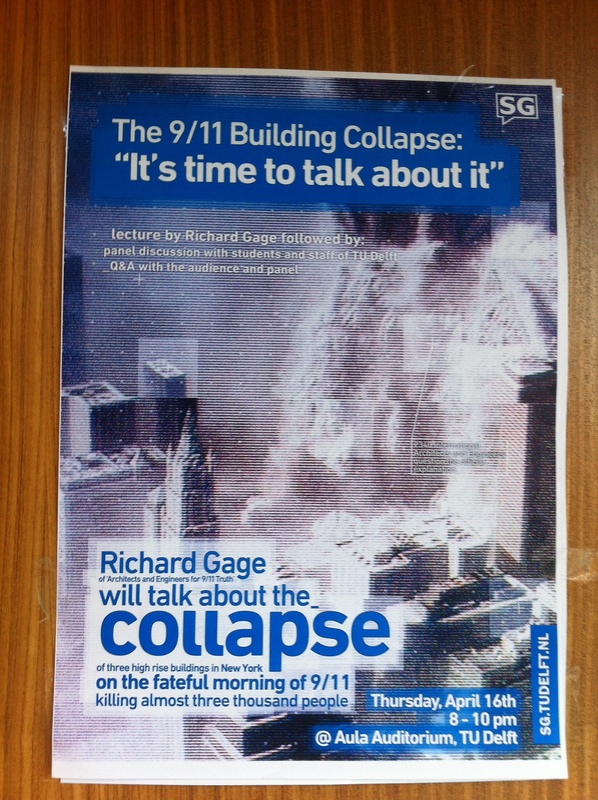 I have organized and participated in many public speaking events where I have discussed my 9-11 research. 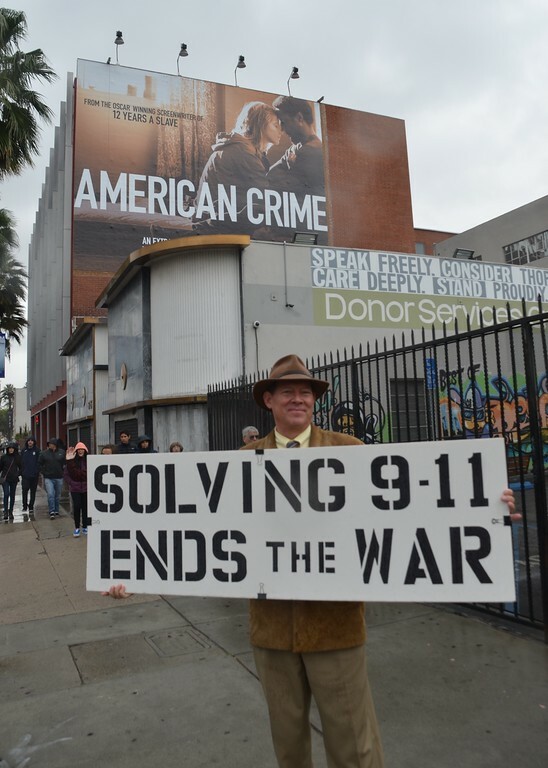 Now that my Solving 9-11research has been published, I have found that speaking to the public about the deception of 9-11 is the best way to bring attention to the massive criminal fraud we have been suffering under since September 11, 2001. The most essential thing about arranging such events is that there needs to be a concerned and competent person who is willing to make the necessary arrangements. Hosting such an event need not be difficult or costly. I, for example, held all my earlier 9-11 events at my local library, which offered excellent meeting rooms absolutely free of charge. My recent events on the West Coast were held in brewery restaurants, a cultural center, a museum, a church, and in private homes. I don't charge admission for such events, but donations are welcome and I offer my books as well. If you would like to invite me to speak and there is a 9-11 truth group in your town, that would be an excellent place to start, but don't let a couple naysayers prevent you from having an event. I have seen from the very beginning how there are people who claim to be interested in the truth about 9-11, but who don't want to hear what I have to say. If you encounter such people in your group, go ahead with the event and invite them to raise their questions when I speak. The question and answer period is an important part of such an event. 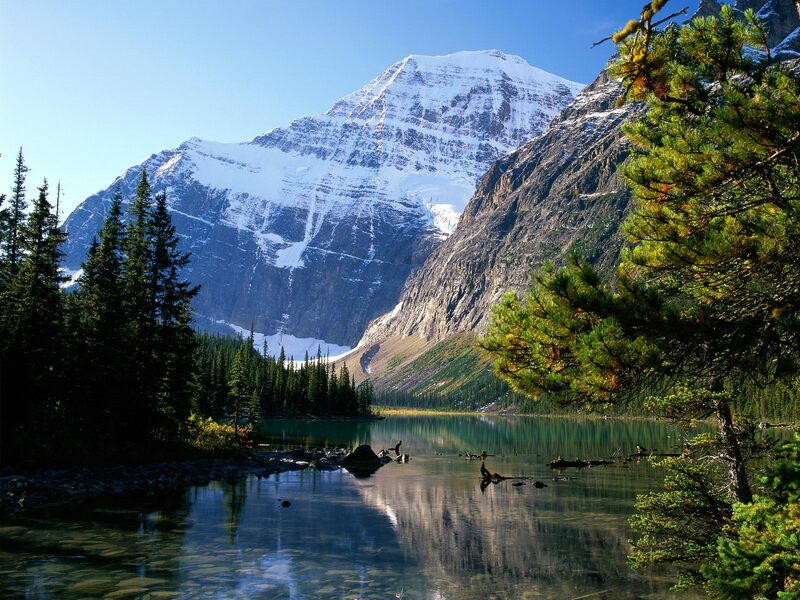 Jasper, a town that lies within a national park, is about 260 miles north of Calgary. Having just concluded a book tour of the West Coast, which took me all the way up to Jasper in the Canadian Rockies, I am already planning to do another tour of the U.S. this coming winter. 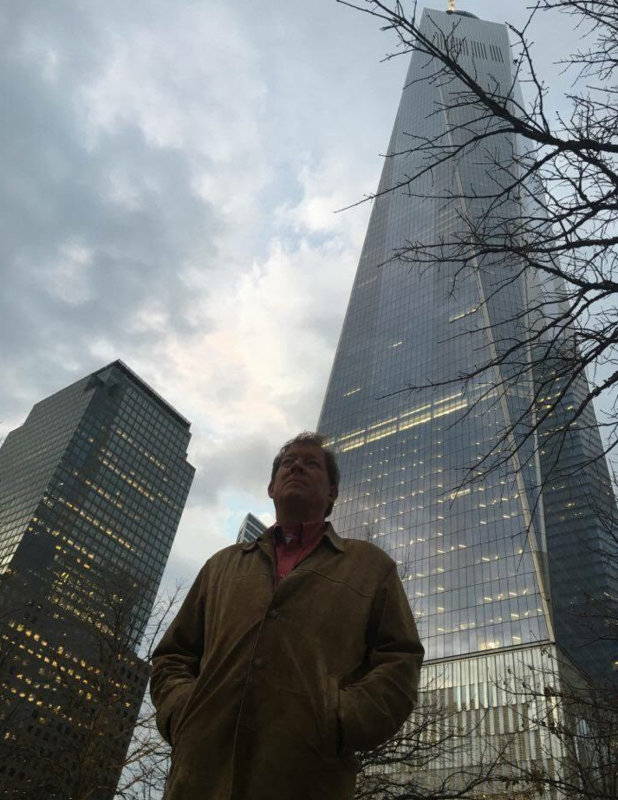 The reason I am so eager to do another tour is because I think it is the best way to bring the message of 9-11 truth to the public. It also generates some controversy, which is good. As I say, embrace controversy. It brings attention to the subject and engages people’s minds like nothing else. 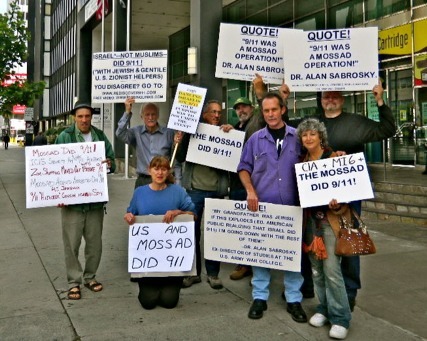 My research, which is published in the Solving 9-11 set of books, is considered controversial by some in the 9-11 truth community because I name the individuals behind the false-flag terror deception that changed the world. At this point, it is safe and easy to say that the official version is a pack of lies. The facts prove that to be the case and a considerable percentage of the American population already realizes that we have been lied to for more than 13 years about what happened on that day. However, showing who is behind the false-flag deception that changed our nation and took us to war is much more difficult, and it is exactly that which makes my research unique. My thesis is controversial only to those who have not yet read theSolving 9-11 books. Once one has carefully read the material it is virtually impossible to argue against it because the books present all the facts that support my thesis that 9-11 was fundamentally an Israeli and Zionist operation. If one reads the larger book, Solving 9-11: The Original Articles - which contains all my 9-11 research articles in chronological order from 2001 to 2012 - the honest reader will come to the same conclusion that I have. I am trying to reach out to 9-11 truth activists to find those who would like to arrange an event where I can present my research and answer questions from the public. If you would like me to speak at an event in your town, send me an email at bollyn.books@yahoo.com and we can discuss the details. Or you can contact me by using theFeedback tab. 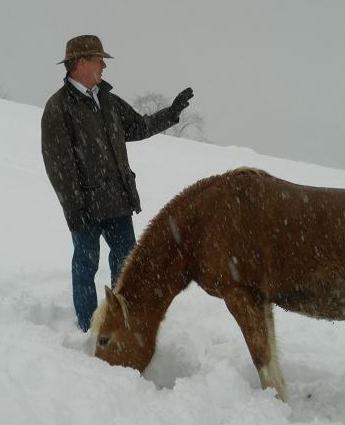 Please let me know if you are interested in helping arrange a presentation in your town this winter. 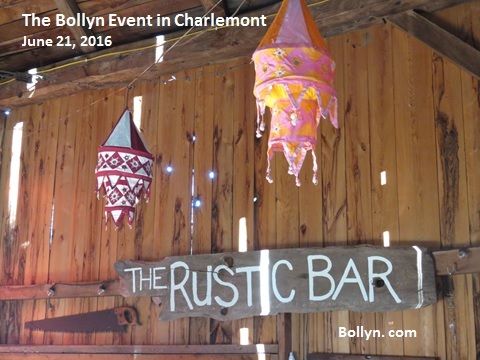 The event in Jasper was special because it was organized by only one woman, Monika Schaefer, in less than ten days! The venue was the Jasper Museum, the director of which was contacted by a person in distant Calgary a few days prior to the event, and told to cancel the event “at all costs”. This created quite a controversy and the young director of the museum handled it very well, explaining at the beginning of the event that free speech is a cherished right in Canada and that Monika’s right to rent the room and present the event had to be respected in a democratic society. The detractor from Calgary also contacted the local newspaper, The Fitzhugh, and repeated his complaint about the forthcoming event to the editor, which resulted in the paper sending a reporter to cover my speech. As I say, controversy is very good because it focuses public attention on what is being discussed. Sorry to hear your website was under assault last week. 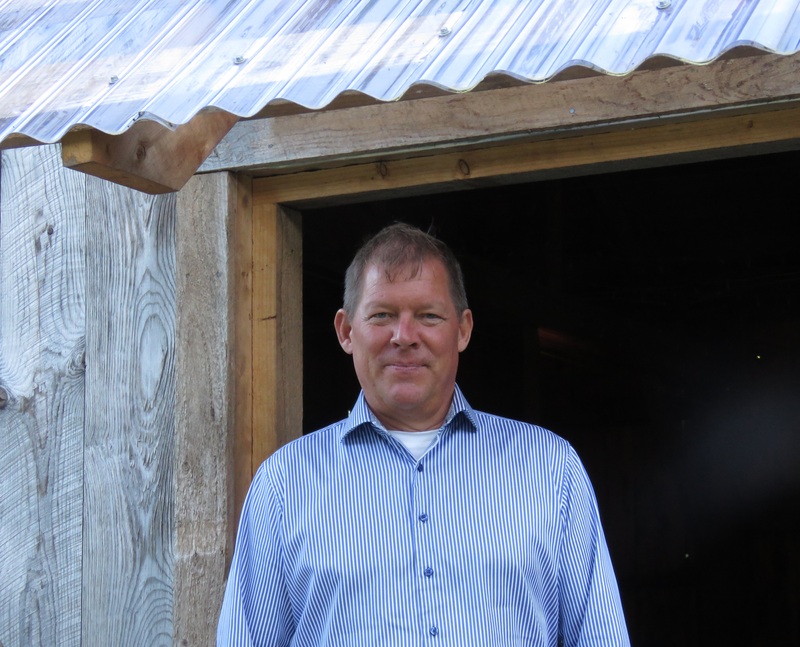 The article on Christopher Bollyn would have generated lively debate in your comments section. 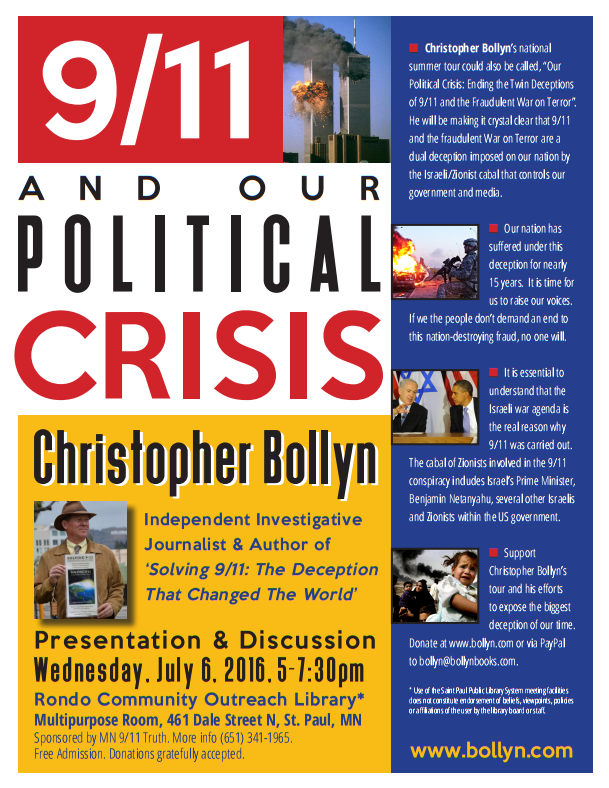 I was privileged to attend Bollyn’s talk and found his experience in discussing the events of 9/11 enlightening. 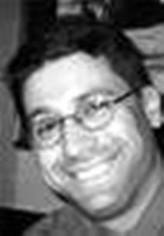 Among the various 9/11 researchers, Bollyn has his own unique perspective having been an active journalist in the mainstream media at the time and having lost his job due to his reporting of events as they unfolded. Looking back to Oct. 1, I realize that while Bollyn is indeed a giant in the truth movement, the hero of the evening was Monika Schaefer. She arranged the whole event from start to finish and paid for it to boot. A lot of work went into scheduling the author, arranging a date, finding a venue, promoting the event, organizing refreshments and all the myriad details. She even hired a videographer to record the proceedings. You can access the video on YouTube via Bollyn’s website. So what drives an ordinary person to take these extraordinary measures? In conversation Monika has articulated to me that she is passionate about world peace and she believes it cannot exist in a climate of lies. Like Bollyn, she would rather forgo some personal comforts than remain silent about the massive deceit in “the free world” today. Nor are her efforts entirely altruistic, she recognizes that the “good life” is a shallow dream built on the backs of the unfortunate. Harmony, peace and security can never exist without respect and equality for all. Monika has accepted the challenge, let’s give her a hand. 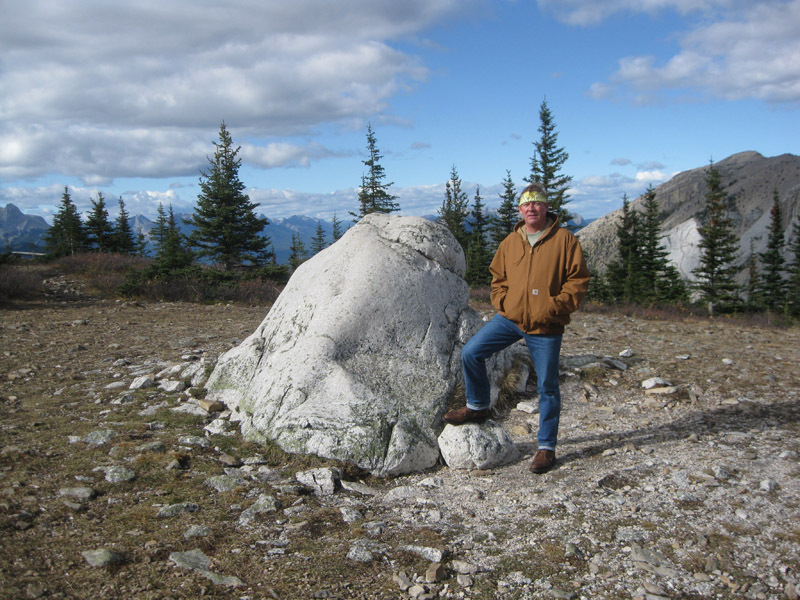 Christopher Bollyn's Solving 9-11 book tour reached Canada's Jasper National Park on October 1, 2014. Bollyn spoke at the Jasper Museum. Bollyn hiking in the mountains near Jasper. 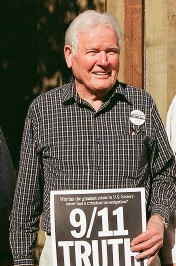 Hank Joerger of Davis, California, was an early leader and steadfast supporter of the 9-11 truth movement. Elmer Henry “Hank” Joerger Jr., 92, died in West Sacramento on March 1, 2014. Hank would have celebrated his 93rd birthday on Sunday, March 16. With Hank's passing the 9-11 truth movement has lost one of its greatest supporters. Hank was born in Clarksville on March 16, 1921. His family moved to Woodland in 1929. 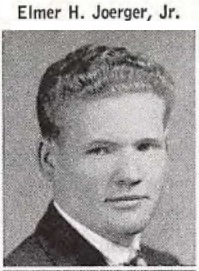 He graduated valedictorian of his class from Woodland High School in 1939. He graduated from UC Berkeley in 1943 with a bachelor’s degree in chemistry. Hank fought in World War II in 1944-1945. He was in Headquarters Company, 1st Battalion, 394th Infantry Regiment, 99th Infantry Division. His regiment was instrumental in holding the north flank at the Battle of the Bulge. He was highly decorated for his heroism and leadership. In October 1945, Lt. Joerger took over command of Baker Company. 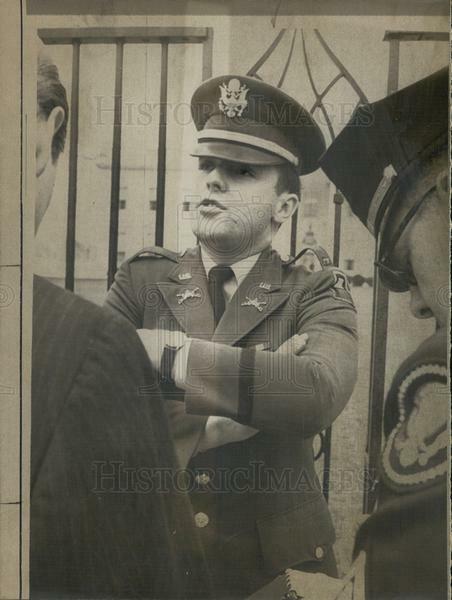 Hank served as captain of the guard at the Nuremberg Trials and captain at Fort Ord during the Korean War. 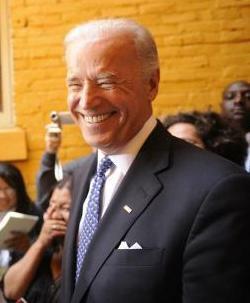 In 2004, he became very involved in the 911 Truth Movement to which he provided his time and financial support. 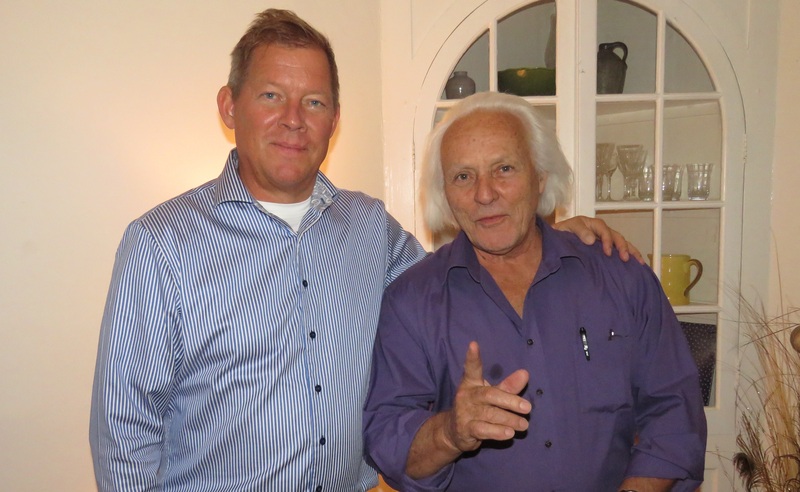 Hank contacted me in January 2012 and provided the encouragement and support I needed to publish my Solving 9-11 research. 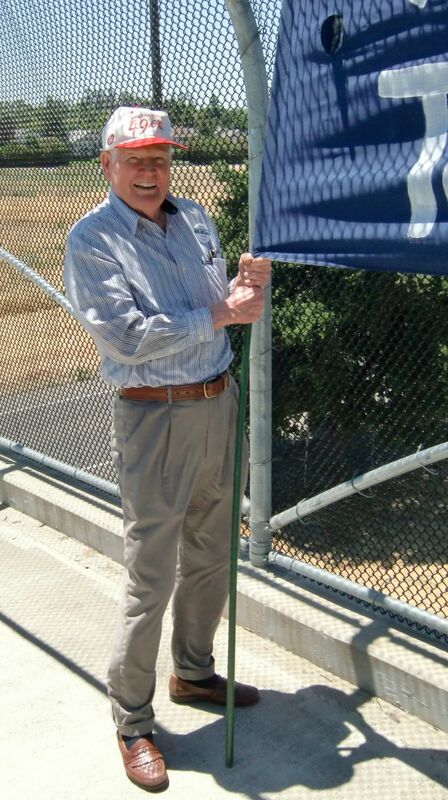 I was very happy to have such a solid supporter in Davis, where my college career began. I regret that I did not know about Hank and his 9-11 truth group when I visited Davis in the spring of 2006 and that I was unable to visit him later. Rest in peace, Hank, you did great things in your life to bring the truth to your fellow man. It is essential for our political and spiritual well-being that we investigate and prosecute those responsible for the crimes and cover-up of 9-11. We cannot move forward until this crime is properly prosecuted. The following is an introduction to the 9-11 Justice Campaign, an organization that is seeking to bring the culprits of 9-11 to justice. 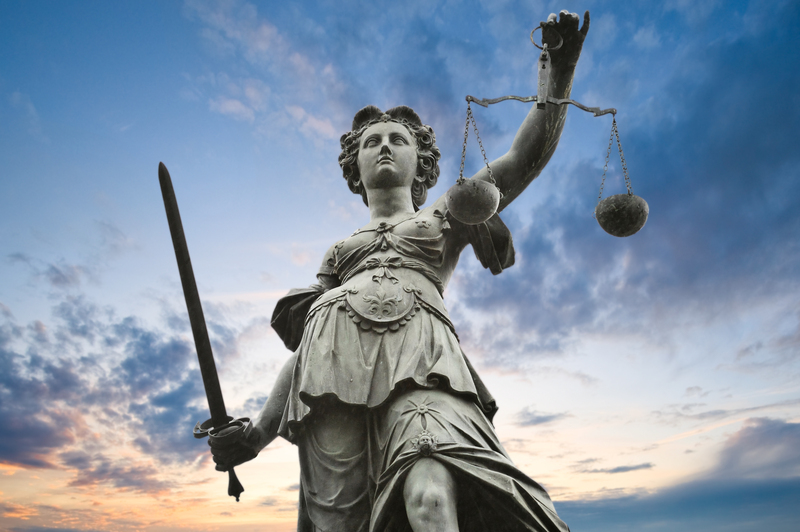 The 9-11 Justice Campaign… Now or Never! The terrible events of 9-11 have been more thoroughly and widely investigated than anything else in modern history. Thousands of earnest people from around the world have collectively spent millions of hours over the years researching every aspect of that fateful day. Consequently, this large investigative community knows with absolute certainty that the Official Conspiracy Theory (OCT) asserting 19 Arab hijackers – the OCT concocted by the actual perpetrators and promoted by the global media – is an outrageous, often self-contradictory and physically impossible, web of lies. The community knows as well from the 9-11 planners at the Project for a New American Century (PNAC) the purposes of 9-11: to wage war, steal natural resources, and promote the emerging New World Order (NWO) Global Fascist Police State. We, the investigators, know what really happened on 9-11; we know who the leading suspects are (see whodidit.org for a partial list); and we know cui bono, who benefited. So, without further investigation, we have sufficient evidence to convene a Grand Jury, subpoena the leading suspected coconspirators, and issue indictments. We must set our sights on 9-11 Justice, while we still can. 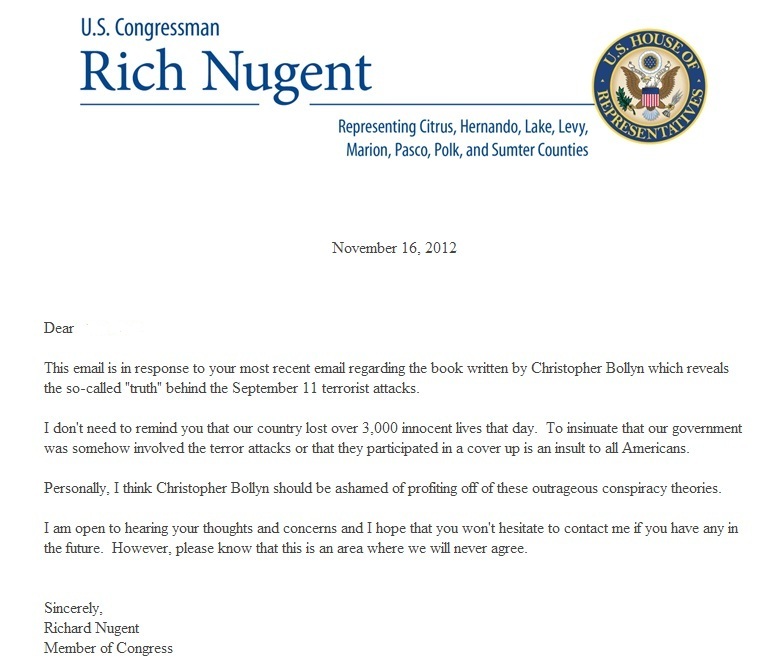 A reader from Florida's west coast asked her U.S. Congressman,Rep. 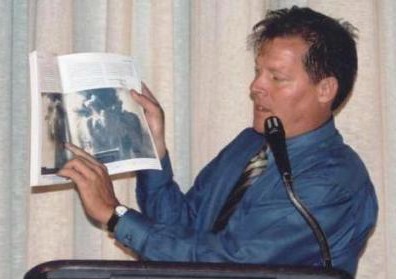 Richard B. Nugent, the former sheriff of Hernando County, for his opinion of the evidence presented in Solving 9-11: The Deception that Changed the World. 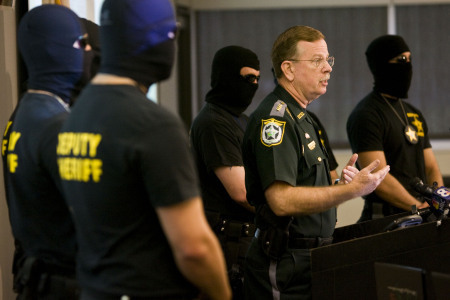 Rich Nugent was Sheriff of Hernando County, Florida, from 2000-2010. I find your reply demeaning and insulting. Of course 3,000 innocent lives were lost on 9-11. THAT is WHY the event demands intelligent investigation, not a virtual ad hominem attack on people like me who question the true cause, reason, and perpetrators of the horrific event. The response I would expect from you, whom I have helped elect, is a commitment to read the book, and either confirm the validity of Bollyn's findings or give HARD EVIDENCE that he is wrong. THAT would be an intelligent reply. As far as I can tell, Bollyn is not profiting from the book because, for one reason, multitudes are simply emotionally unequipped to entertain the thought that their government could ever be complicit in something so evil, and so his book will not be in any top ten. Also, he gives away countless books, and the whole book is available free online for anyone to read. “I am open to hearing your thoughts and concerns and I hope that you won't hesitate to contact me if you have any in the future. However, please know that this is an area where we will never agree." As an ordinary citizen, and a grandmother in my 70s, I do not have the training or resources to adequately research the truth or falsity of Bollyn's conclusions. You, my U.S. representative do. My own logical processes - though they may be limited compared to those of others with perhaps legal, forensic, etc., training - do see truth -- scary truth - in Solving 9-11: The Deception that Changed the World. I look to you to study the issue and confirm whether or not it is true. Expecting to hear from you in the near future. 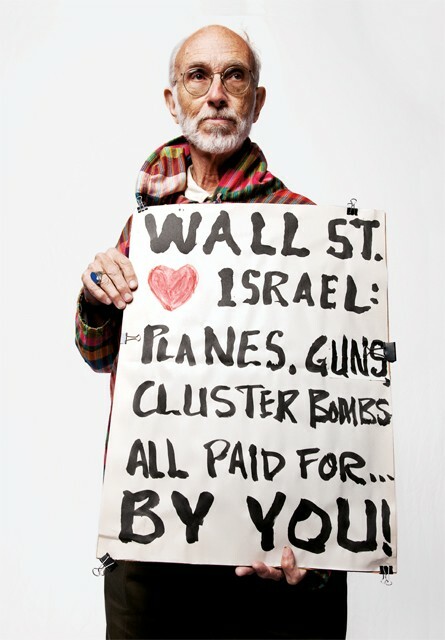 WALL STREET LOVES ISRAEL - Ed Morris, a 70-year-old American, is one of the "Faces of Occupy Wall Street". Morris told Newsweek why he joined the protests: "Our country has been so numb and so cruel and it’s great that people are waking up." 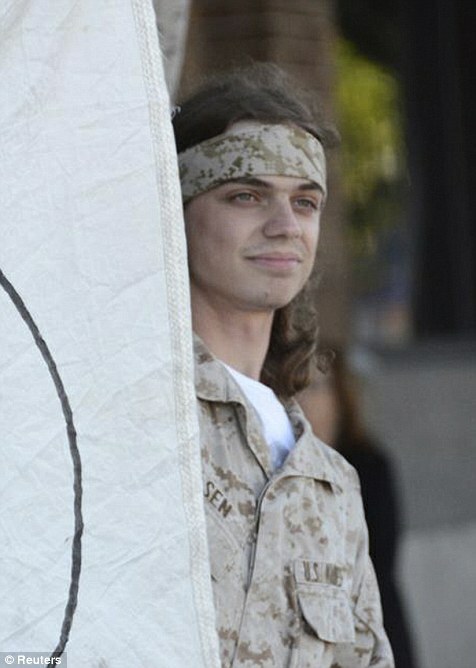 Scott Olsen is a 24-year-old from Wisconsin who joined Veterans for Peace after moving to San Francisco. 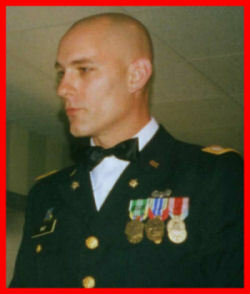 Olsen is a former U.S. Marine who served two tours in Iraq in 2006 and 2007. Veterans for Peace use non-violent protest methods to increase public awareness of the costs of war. when he was seriously injured after being struck by a projectile fired by police at close range. 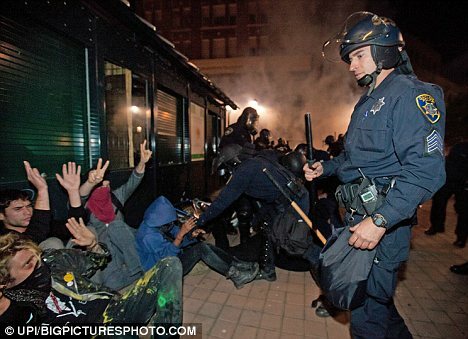 "Oakland Police Department fired a tear gas canister at his head, fracturing his skull," Shepherd said. 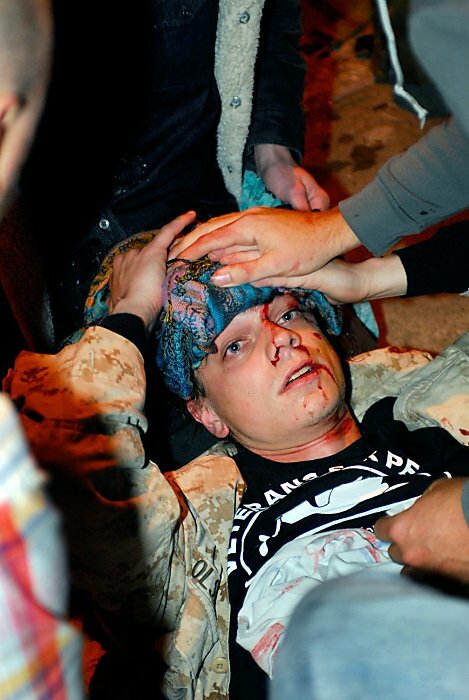 Olsen was peacefully protesting when he was shot in the head by the police projectile at very close range. The police then lobbed a stun grenade into the midst of the people who came to aid the fallen vet. This is clearly criminal conduct by the police. The best coverage of this incident is in the Daily Mail. The following video clip shows the police lobbing a stun grenade at those who came to help the seriously wounded veteran. A second Iraq War veteran, Kayvan Sabeghi, has been seriously injured at the hands of the Oakland police. After police beat him with batons, Sabehgi was jailed and denied medical care, which he urgently needed. He is in intensive care with a lacerated spleen. Sabeghi, 32, was walking home when he was beaten by police and charged with resisting arrest. Sabeghi's business partner in a micro-brewery, Esther Goodstal, told the AP, "I saw he had bruises all over his body, and that's not right. No one should treat another human being like this." 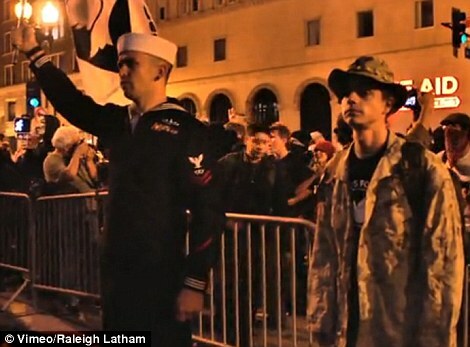 The Iraq war vet had been taking part in Wednesday's march on the port, but left when it was over. "After that, he went out with his friend and had dinner," Goodstal said. When dinner was over, Sabeghi decided to call it a night because he had to work Thursday. He was walking home in west Oakland sometime late Wednesday or early Thursday when he encountered a line of police at the protest who wouldn't let him through, Goodstal said. "Literally, you (could) see his apartment," she said. "The police for some reason ... said, `No, you cannot pass.'" Goodstal said Sabeghi told her he tried to explain his situation and officers began hitting him with batons. 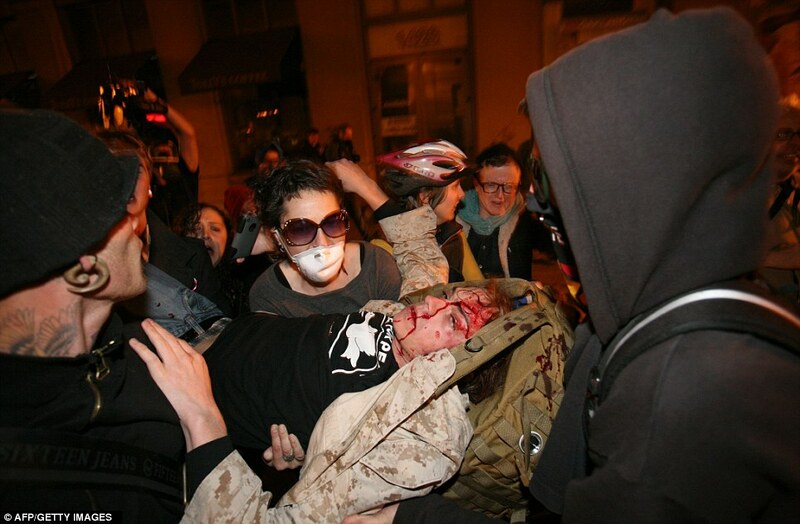 The police in Oakland have used excessive violence on the protestors, seriously injuring at least two Iraq war veterans. Thus far no criminal charges have been laid against the police who shot Scott Olsen in the head with a tear gas canister. The on-going American protest movement is similar to the Palestinian Intifada in that it is a popular uprising against a criminal regime that has simply become too oppressive to bear any longer. While the U.S. government engages in costly illegal wars and targeted assassinations in at least 6 nations the American people chafe under the heavy costs incurred by the criminal war-mongering regime in Washington. A common grievance of the anti-war protest movement across the United States is how greedy corporations are robbing the American people. The top 100 corporations that provide weapons and equipment for the Pentagon received hundreds of billions of tax-payer dollars in 2010 while the American people are being asked to tighten their belts and do without the basic benefits that people in most developed nations take for granted. The top war contractors receive tens of billions of dollars "appropriated" for them by corrupt members of Congress - at the expense of the American taxpayer. General Dynamics, for example, No. 5 on the list, received nearly 4,730 Million dollars in defense contracts alone in 2010. General Dynamics has long been owned and controlled by the Crown family of Chicago, devoted supporters of Israel - and financial backers of Barack Obama. The corrupting relationship between these Zionist war profiteers and the Obama administration is discussed in greater detail in my recent article "Chicago's Elders of Zion and Obama's War for Profit"
And what country can preserve its liberties, if its rulers are not warned from time to time that this people preserve the spirit of resistance? Let them take arms.... The tree of liberty must be refreshed from time to time, with the blood of patriots and tyrants. Unlike the protest movements in other nations, the popular uprising in the United States is armed - very well armed. 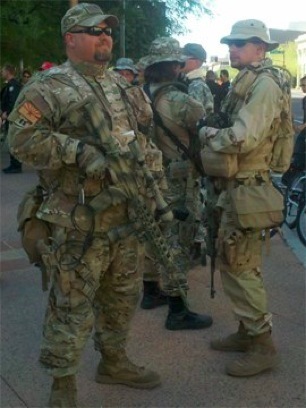 Exercising the Constitutional right to bear arms, a "well regulated militia" in Arizona took part in the Occupy Phoenix protest on 15 October 2011. The presence of a group of well-armed and trained veterans was meant to help keep the peace and protect the protestors from police violence. The presence of a well-trained militia of armed veterans to protect the demonstrators from police violence is clearly an effective strategy. The police are much less likely to use violence or fire upon a group of citizens that can fire back. Police in Oakland, California, on the other hand, fired on peaceful veterans who were trying to keep the peace - but were not armed. 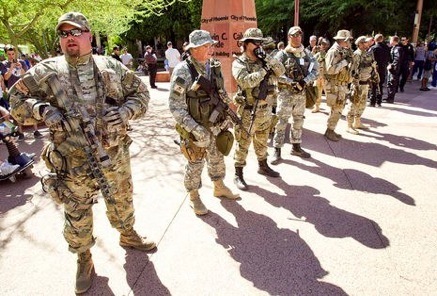 “OCCUPY PHOENIX” - 15 October 2011 - The U.S. Border Guard, a private organization of U.S. veterans that patrols the border with Mexico, deployed an urban combat trained security squad to the Occupy Phoenix rally as armed peace keepers and legal observers. The Rangers took a non-political stance to defend peaceful assembly and free speech of all citizens by exercising their Constitutional right to keep and bear arms. Brave people like McAllister who stand up to protest the Zionist crimocracy behind the illegal wars of conquest and the plundering of the U.S. Treasury invariably find their freedom of speech rights denied and their motivations questioned. It is certainly not "hate speech" to identify the culprits behind such massive crimes. We are a young generation of Jews who don't intend to sit by in silence and allow prime ministers who commit crimes against humanity speak. As far as we're concerned he can speak at the International Criminal Court in the Hague. 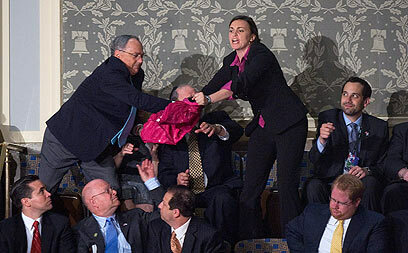 Rachel Tanya Abileah, a 28-year-old American Jewish woman from Half Moon Bay, California was assaulted by members of AIPAC, the Zionist lobby, after she disrupted Benjamin Netanyahu as he addressed the U.S. Congress. In the 7-minute video below, Rae Abileah, whose father is an Israeli, explains why she disrupted the speech by the Israeli prime minister -- and what happened to her afterwards. 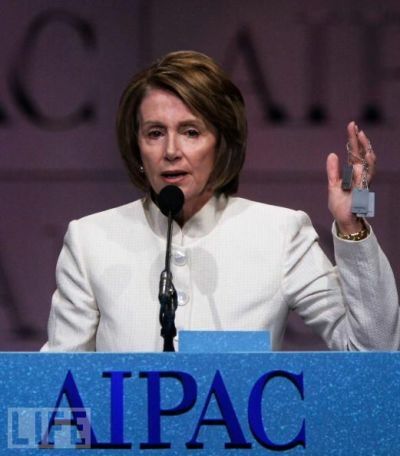 after which she was strangled and assaulted by members of AIPAC. Why were those who assaulted Abileah inside the halls of the U.S. Congress not charged with assault? Abileah bravely stood up and challenged the criminal head of the outlaw state of Israel. Her action is a brilliant example of effective citizen action to shame and bring attention to the criminal leaders of the state of Israel. I am encouraged to see a brave Israeli-American woman standing up against the criminals who control the so-called Jewish state. Abileah shows what it means to stand up for our fundamental American values. As she says, Netanyahu and the terrorist Likud party make a mockery of true Jewish values but that most American Jews are afraid to speak out. A culture of "silence and fear" prevails in the Jewish community, Abileah says. 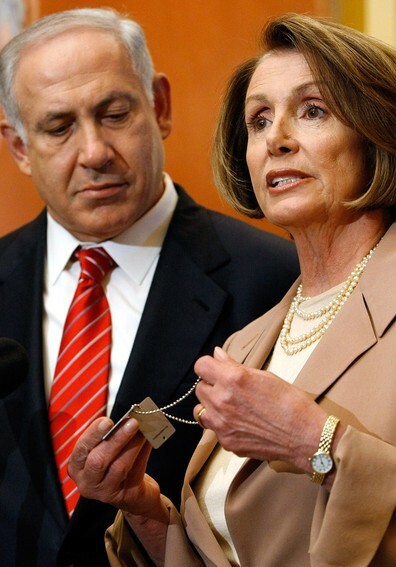 The most violent Zionist faction, the Likud, holds the state of Israel, the U.S. Congress, and the Jewish community hostage with its gangster tactics - and terrorism. It's time for more Americans to stand up against Israeli gangsterism and its criminal lobby. 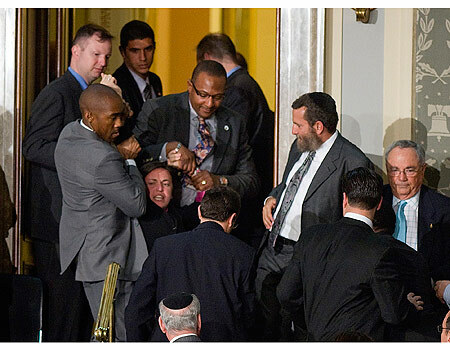 WASHINGTON – Rae Abileah, a woman of Israeli descent who interrupted Prime Minister Benjamin Netanyahu's speech before the US Congress Tuesday, claims she was beaten by AIPAC activists. "I yelled 'Stop the occupation' and immediately they jumped on me," she told Ynet. 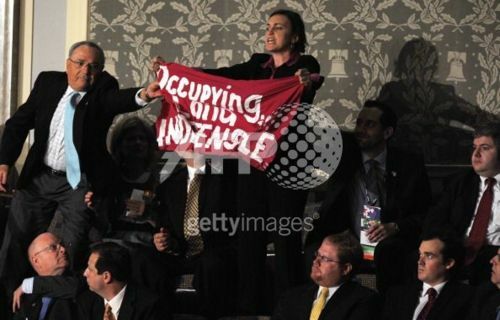 Abileah, a 28-year old Jewish daughter of an Israeli, is a member of Code Pink, a pacifist organization. She told Ynet that she had disrupted another speech by Netanyahu at the Jewish Federations General Assembly in New Orleans in November. Abileah says she used a card procured by a friend to sneak into the House of Representatives. "When Netanyahu began to speak about Israel and democracy a got up to speak against its anti-democratic operations," she said. But the disruption won no support from Netanyahu's audience. The prime minister also shrugged off the display, and took advantage of it to praise the democratic values of freedom of speech and protest. "You can't have these protests in Tehran," he said. "This is real democracy." "Bibi says the 1967 borders are indefensible and I say the occupation and starvation in Gaza are indefensible," the activist said, adding criticism over Cast Lead and the IDF's use of weapons purchased "at the expense of the US taxpayer". Abileah was born in California to an Israeli man from Ramat Gan. 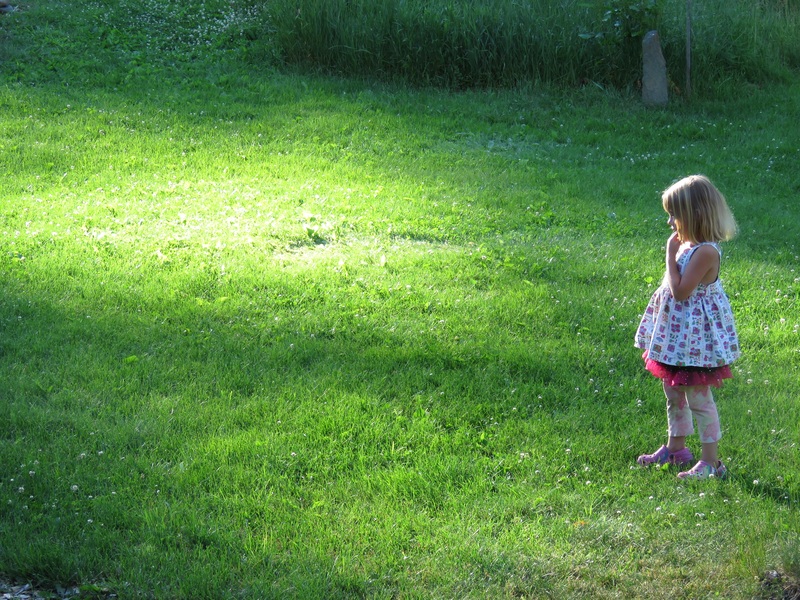 She declined to comment on her family's feelings over her outspokenness against Israel. She says she has chosen to focus her protest against AIPAC in the US because "it is a lobby that silences any opposing opinion". Abileah added that financial pressure should be leveraged against Israel and "its leaders should be persecuted". Is complicity in mass murder a serious matter? Are there people who are above the law, or does the law apply to everyone? The World Trade Center Twin Towers were brought down by explosives that had been strategically positioned inside them. Do you honestly not know this? 2,801 people were killed when the radio signals were given that set off these explosives and made the buildings crash to the ground in heaps of smoldering rubble. The people who gave the orders to throw the switches on the explosives knew very well that there were many human beings still inside these buildings, who would be killed. That is murder in the first degree, is it not? Two thousand, eight hundred, and one counts of murder in the first degree! The evidence that the Twin Towers were brought down by explosives is so overwhelming that I cannot believe you are unaware of this. It follows that you are in complicity. The same goes for the mainstream media. Complicity in mass murder. I can only surmise that your position is that some people are above the law – that the law was never intended to apply to everyone. I expect that you feel the same way regarding morality. It does not apply to everyone. God has given a privileged few liberty to do evil, even to murder. Prove me wrong. Conduct an honest investigation with subpoena power on 9/11. And have it be televised on the mainstream channels, please. P.S. Is an American government in the United States too much to ask? 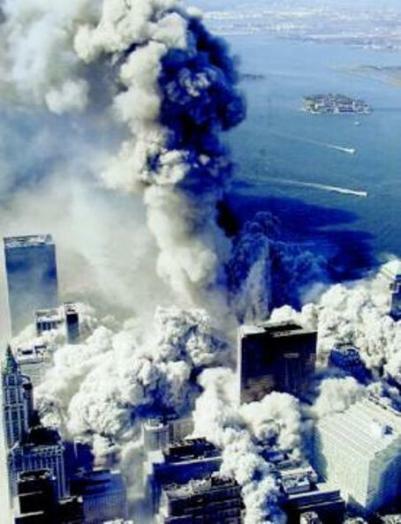 Thousands of innocent Americans were murdered when the Twin Towers were destroyed with high-tech explosives, including a form of super-thermite that pulverized the concrete floors. A large amount of unexploded super-thermite (a bi-layered nanocomposite explosive coating) was found in the dust of the World Trade Center. This is solid evidence that the Twin Towers were demolished using pre-placed explosives. 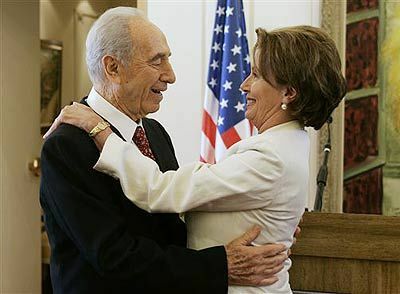 Why has Speaker Pelosi avoided this evidence? Who is she serving by managing a Congressional cover-up of what really happened on 9/11? 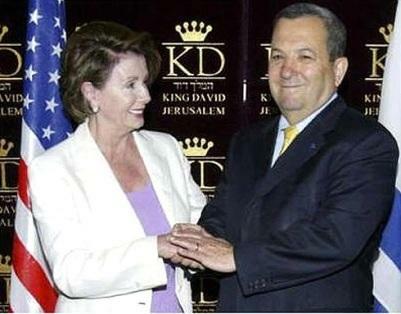 Speaker Pelosi certainly stands close to the outlaw state of Israel. Here are photos of the Speaker with four of the most notorious criminal leaders of the Zionist state and Rahm Emanuel, one of Israel's highest level agents. 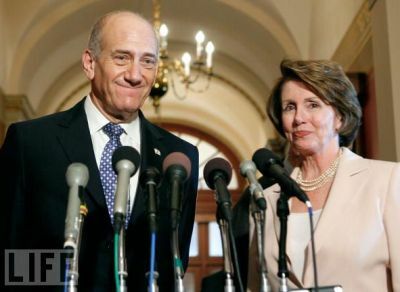 Each and every one of the men seen below with Pelosi is suspected of complicity in the false-flag terror attacks of 9/11. which no one in the U.S. government or media seems at all interested in. 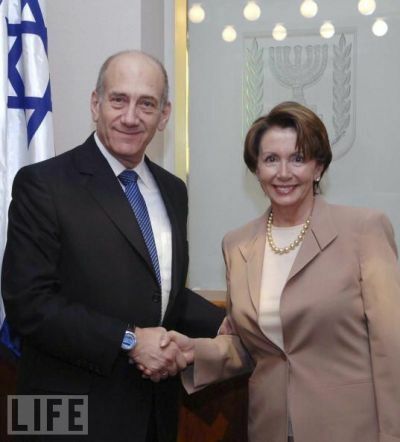 Pelosi must know that Olmert was in New York City on 9/11. Why is she protecting the criminals behind the mass murder of thousands of American citizens? and enjoying some affection from a fellow Zionist agent in the U.S. government, Rahm Emanuel. 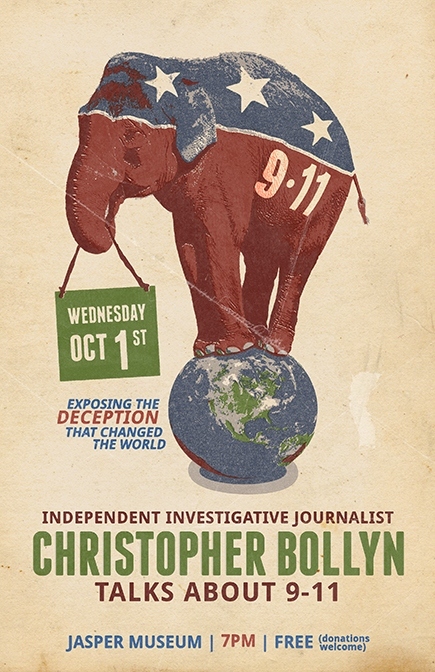 Please go to Bollyn.com and read Christopher Bollyn's great E-book Solving 9/11 - The Deception that Changed the World. If you do, maybe I'll see you carrying a placard at the next action in front of the Israeli Consulate. 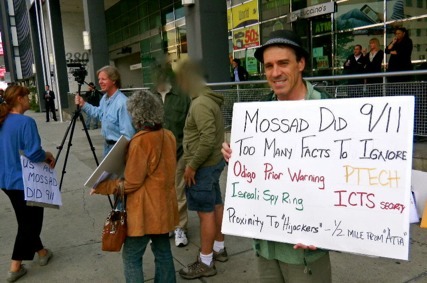 On Tuesday, May 18, there was a public demonstration at the Israeli Consulate in Los Angeles by people who are convinced that Israeli intelligence, i.e. 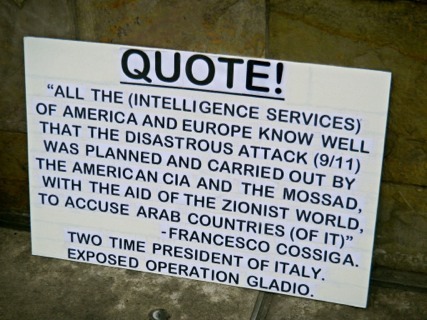 the Mossad with Gentile and Jewish agents, carried out the false-flag terror attacks of 9/11. The following photos are from this historic demonstration (the first of its kind) in front of the Israeli Consulate at 6380 Wilshire Blvd. in Los Angeles. Zan (on right) is a 9-11 truth activist in Los Angeles. 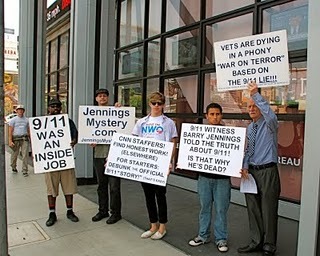 Here Zan leads a protest in Los Angeles with a sign saying, VETS ARE DYING IN A PHONY "WAR ON TERROR" BASED ON 9-11 LIES!!! Millions of Americans now know that the official explanation about 9-11 is nothing but a pack of lies. It takes moral courage to protest like this and such courage is required of citizens who want to live in a civilized and ethically-guided society. 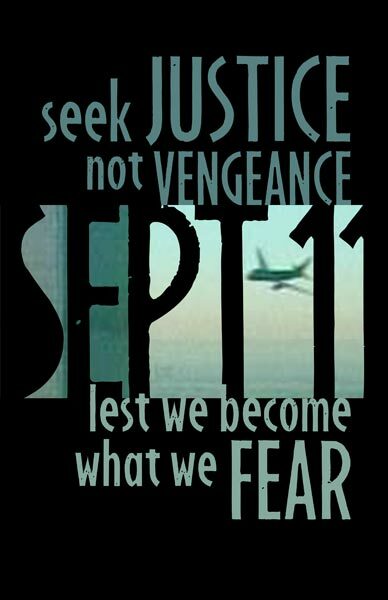 It is time to show our moral courage and take a stand against our nation's enslavement to the lies about 9-11. 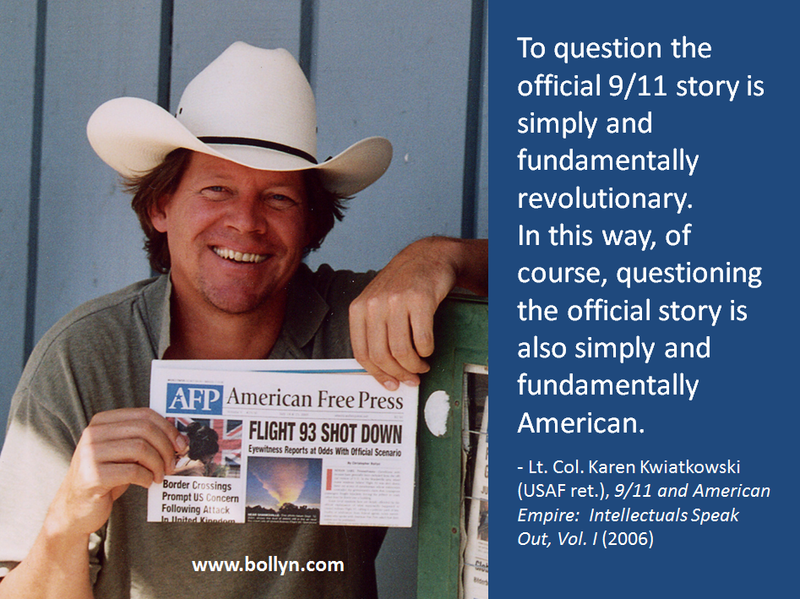 The 9-11 truth demonstration was arranged by Zan, a patriotic American with great moral courage. Zan can be seen in the video below. Zan is showing Americans how they should use their freedom of speech to expose the Israeli role in the deception that changed our nation. We need to stand up and show that we know that Israel was behind 9-11 and that we reject the Zionist logic of terrorism, intimidation, and war. Zan has also written a letter about the protest to TRIBE, a magazine for Jews in Los Angeles. Zan has a great deal of moral courage, which is bravery in the face of fear to fight injustice when others look away or choose to do nothing. Moral courage is the strength in one's heart to take risks to stand up for what is right. WE KNOW HOW THE ATROCITY WAS DONE! THE AMERICAN PUBLIC AND THE WORLD NEED TO KNOW WHO DID IT! 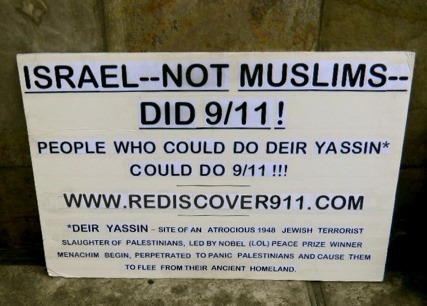 ISRAEL NEEDS TO KNOW THAT MORE AND MORE PEOPLE ARE LEARNING THAT ISRAEL DID 9/11! THIS IS A TRUTH WHOSE TIME HAS FINALLY COME! This email is directed at people in the 9/11 Truth Movement. Some of you are fully on board with the idea of Israeli guilt. Some of you are not. If you will do that: People who don’t believe Israel’s leaders did 9/11 may change their minds and join us. People who believe Israel’s leaders did 9/11 will be better informed and better advocates for the idea. Please join us on Tuesday, the 18th. We need to make a good showing! Please spread the word about this event, even to people not in the Los Angeles area. Those people can spread the word to their contacts, some of whom may be in the area. If you intend to be part of the demonstration, it is essential that you email me at zanrumg at aol dot com and let me know. We need to know how many placards to prepare. To present a unified message we will provide placards and flyers to hand out. There will be a police presence so no one need fear violence. The following article is about Zan's one-man demonstration in Los Angeles, which was videotaped. 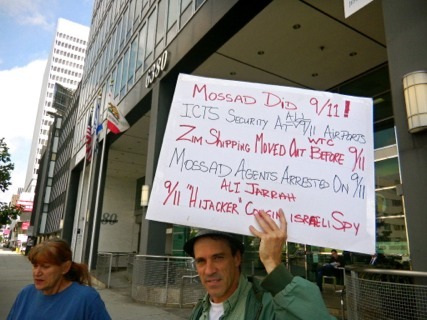 The article has been updated with photos of a Zionist Jew attacking Zan on a sidewalk in Los Angeles as he peacefully picketed with a sign that said "Israel - not Muslims - did 9-11". These photos open up the much neglected subject of Zionist violence against American 9-11 truth activists. Like Zan in Los Angeles, I have been subjected to Zionist violence and malicious prosecution for exercising my Constitutional rights while pursuing the truth of what happened on 9-11, as have fellow 9-11 activists in Worcester, Massachusetts. It should be noted that all three victims of Zionist violence (Zan, Bollyn, and Hmura) were attacked for peacefully exercising their Constitutional freedom of speech. The Jewish man attacks Zan, ripping his signs away, trying to tear them up, and throwing them to the ground. Zan is seen picking up his signs. Who is this man? Violence is inherent to Zionism, a racist ideology of Jewish supremacism that seeks to impose itself on the people of Palestine and the Middle East -- and the United States of America. People who support Zionism are supporting a state and ideology that was born in massacres and ethnic cleansing and which requires constant violence just to maintain itself. Having seen the injustice and violence inherent to Zionism during my many trips to Israel and Palestine, I am well aware of the support militant Zionism has among American Jews and misguided Gentiles. I also realized that it is not possible or prudent, as an American Christian, to challenge Zionism in Israel and that the crucial struggle is really for the hearts and minds of my fellow Americans. The false-flag terror attacks of 9-11 were actually a massive manifestation of Zionist violence - against innocent Americans. The struggle is now to bring the facts about who is really behind 9-11 and the "War on Terror" to our fellow Americans and to liberate our nation from unnecessary violence and suffering. 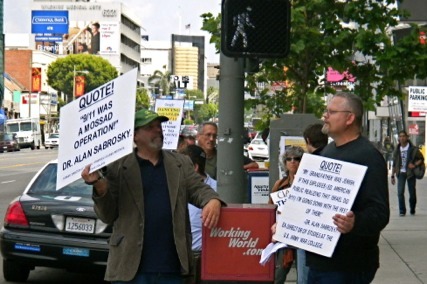 Zan peacefully held his sign and handed out a four-page flyer to those who wanted it, while standing on a sidewalk near a theatre in Los Angeles where an event put on by the conservative radio station KRLA (a Salem Communications station) was taking place last November. We didn't get video of the man in the long white shirt grabbing my signs, trying to rip them up. Failing that, he threw them on the ground and started haranguing me. The video shows him a little later claiming he had a right to express himself as I had a right to express myself. He expressed himself by an act of battery. I told him this is not Israel and I am not a Palestinian. I am attaching two still photos that show the incident, not as fully as I would like but thought it might interest you. After the attack, the aggressive and arrogant Jew tells Zan that attacking him (and his freedom of speech) is his way of expressing himself. I would like to know if anyone knows the name of the arrogant and violent man who attacked Zan. The interaction with the woman who tries to make a joke about "nano-termites" is an example of trying to laugh off the evidence of a very real mass murder. It is similar to the man who tries to belittle Zan by joking that he had lost his mind following a stroke, or the other who said he is "not well." This is the typical use of ad hominem attacks to deny the facts of the message by attacking the messenger. Zan shows how an average American can exercise his right of free speech, peacefully and intelligently, to shame the real culprits of 9-11 while bringing public attention to the huge deception that changed the world. What a great example Zan is for all free, patriotic, and Truth-loving Americans - and like-minded people around the world. Well done, Zan, well done! The AZL, a group of anti-Zionist activists in Worcester, Massachusetts, has come under attack with threats and assaults after calling for an investigation of Michael Goff, who was the founding manager of Ptech and went on to work for the Mossad-linked company, Guardium. The attacks followed AZL interviews done with me last November, which focused on Michael Goff and his role with Ptech. Ptech's enterprise software is thought to be Israeli intelligence spyware which provides unauthorized access to the data on any networks running Ptech software. Michael Goff was a lawyer working with the Jewish law firm of Seder and Chandler in Worcester, Massachusetts, before leaving the firm to work as the general manager and marketing chief for Ptech in the early 1990s. He later worked for the Mossad-linked software company, Guardium. Both his father and grandfather were highest level Jewish Freeemasons of the B'nai B'rith in Worcester, the real Elders of Zion. ALERT TO LAW ENFORCEMENT: Take 1/2 hour of your time to see how far down this country’s gone due to Zionist mafia infiltration. Hear how 87 year old WW2 Vet Anthony Hmura was assaulted, and threatened with death! Hear how a self-described “Mossad Killer” threatened to kill AZL activist, Michael Collins. See the Restore Self Government plan at The AZL, and see how you can help secure a 9/11 investigation of Michael Goff, and GUARDIUM, the Israeli Intelligence-run company which Goff has ties to. STAY TUNED! I quite agree with you about this being a movie, but I don't think that it is a diabolical movie, though the devil and his followers certainly get their share of the lines. I think that we are all following a Divine script. God didn't choose us because we were equal to the parts required of us; He chose us despite our inadequacy, and insists that we continually refer to His direction to overcome it. I think that all of us in the 9/11 truth movement, the antiwar movement and the constitutionalist movement are acting out a Western, and I fully expect that the wicked shall be caught up in their own snares as the cavalry arrives in the nick of time to save the day. I believe that, for His own reasons, He chose me to be a captain in that cavalry -- as He chose you and Patti, Mik and Shahid, Sgt. Maj. Neadow and SFC Buswell. He chose us all. It is for us to live up to the mission He gave us. The two citizen activists were very successful in getting this crucial question asked, on camera, to the Vice President of the United States. This is a excellent example of what the Citizen Action Plan to demand the truth about 9-11 is all about. A reader in Canada is preparing a presentation for the government of Canada. This is what we have to do all across America - to all of our elected officials and public servants. The same question must be asked of our political leaders and media: "Will you address the evidence of super-thermite in the World Trade Center dust, or are you part of the cover-up?" For politicians and the media, there is no middle ground on this matter. [Professor Steven E.] Jones' work needs to be investigated by all media, and when validated, needs to go to the regional political representatives in the form of a demand for answers, and after having gotten that far, there would be absolutely no way to stop it. It is no more complex than that. Any energies spent in any other direction are a waste of resources and energy. "You are apparently doing a fantastic job on the 911 research issue. 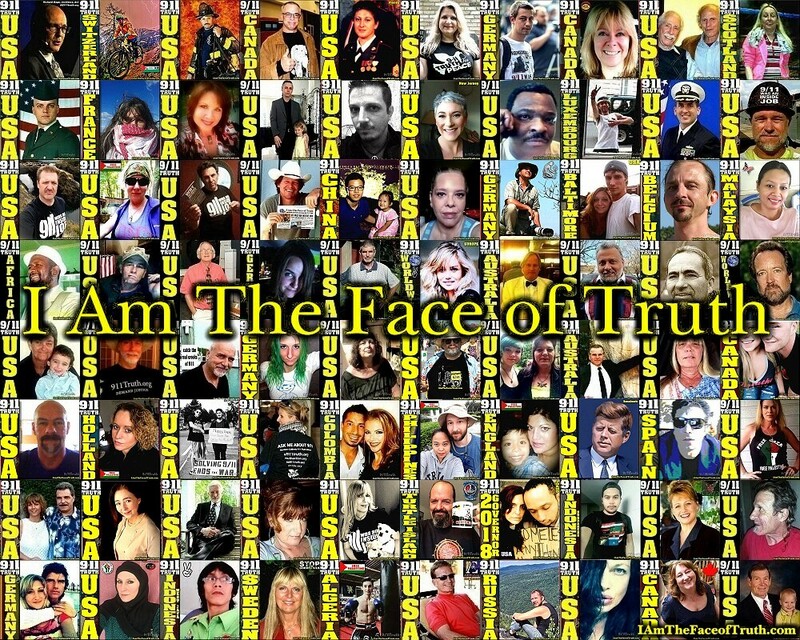 This is a collective effort and it is wonderful to know that people like you are so actively promoting the truth. Keep up the good work!!!" It is time for concerned citizens to ramp up the political pressure for the truth of 9-11. As Dr. Harrit wrote, "this is a collective effort." It is time for a citizen action plan to demand accountability from the mass media and our political leaders! 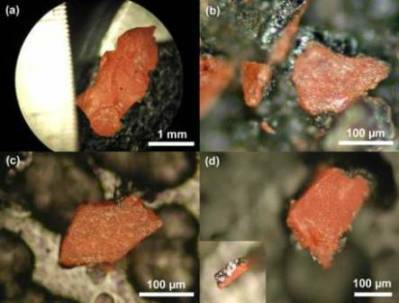 Today, more than 7 years after the terrorism that changed the world, we now have scientific proof that the Twin Towers were demolished - using an extremely powerful form of Thermite, a highly energetic nano-composite known as Super-Thermite. Active bits of this incredibly powerful explosive were found in 4 different samples of dust from the collapsed towers. What we have to do as concerned citizens with moral courage seeking the truth of what really happened on 9-11 is to spread this information to our local news media and ask them to publish the information about this crucial discovery. We also have to bring this discovery to the attention of our local politicians, representatives and senators in the U.S. Congress. We the people have to use our power to force this issue to be discussed in the media and the halls of power. As I said in my articles about this discovery, the writing on the wall is clear for the 9-11 criminals and those involved in the cover-up: it says "Game Over." It is time for us to pull the plug on those who have hijacked the truth about 9-11 for more than 7 years. I urge you to send the link to the scientific paper entitled "Active Thermitic Material Discovered in Dust from the 9-11 World Trade Center Catastrophe" to your local and national news media. Send it to your political leaders at the local, state, and national levels. Demand that they address this discovery and investigate who is responsible for putting massive amounts of Super-Thermite in the Twin Towers before 9-11.